It was mostly sunny and 10 degrees and I decided to investigate the proposed cultural heritage site of Victoria Square. 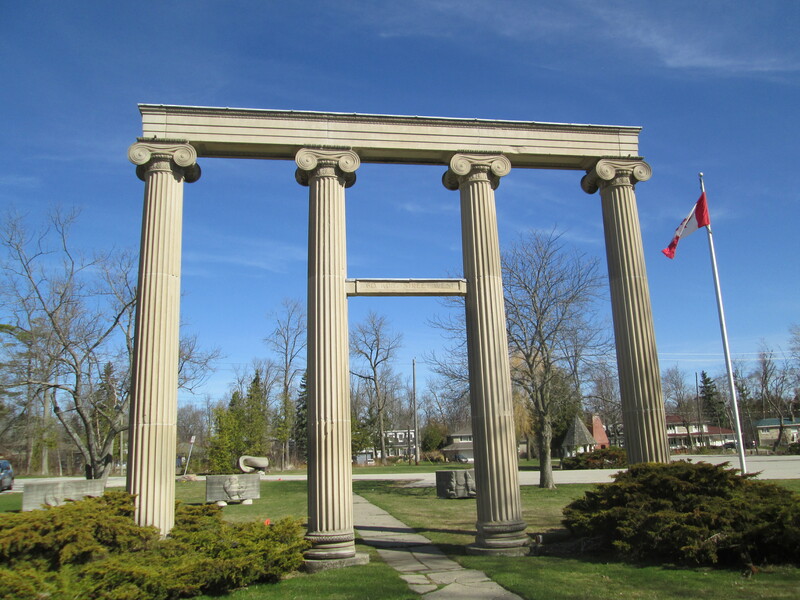 Unlike many of the communities in rural Ontario that grew up around a mill site, Victoria Square was established in 1805 as Reid’s Corners at a crossroads and served the local farmers. The 1901 census shows 117 people, most of them farmers or retired farmers and children. 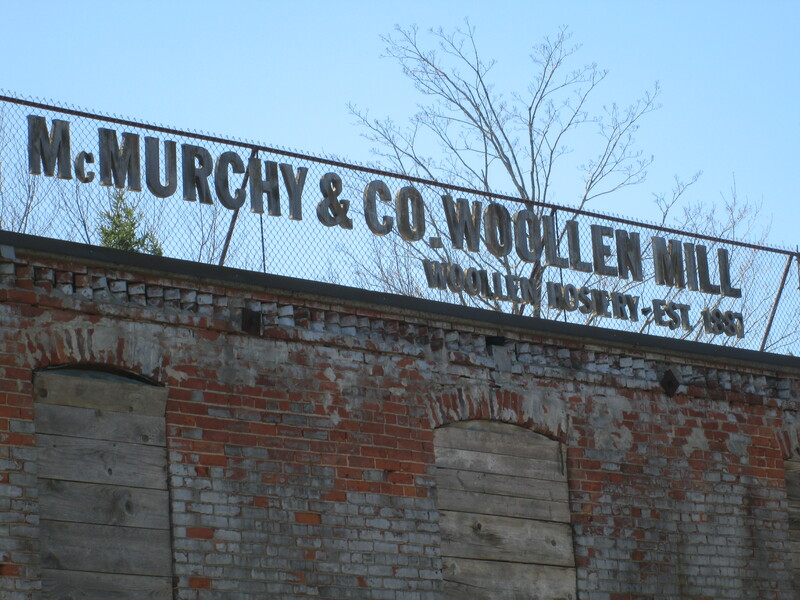 The businesses in town tended to be those that supported that local industry. 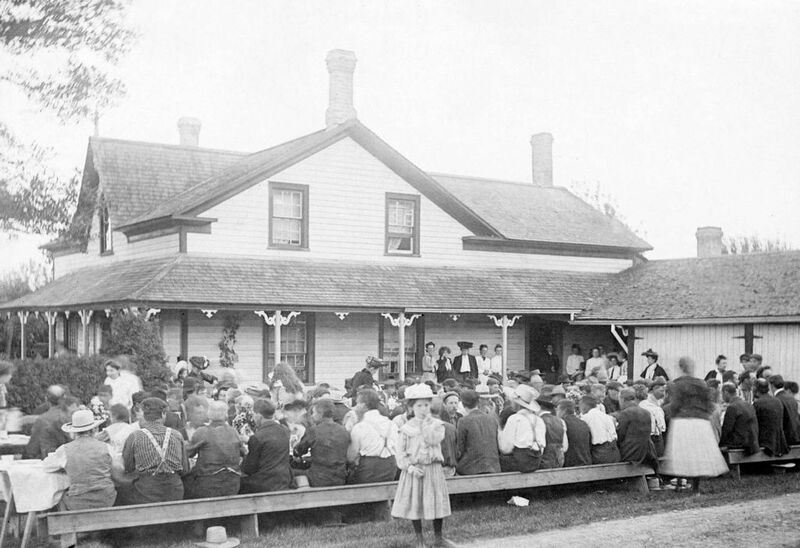 The cover photo shows the hamlet around 1900. 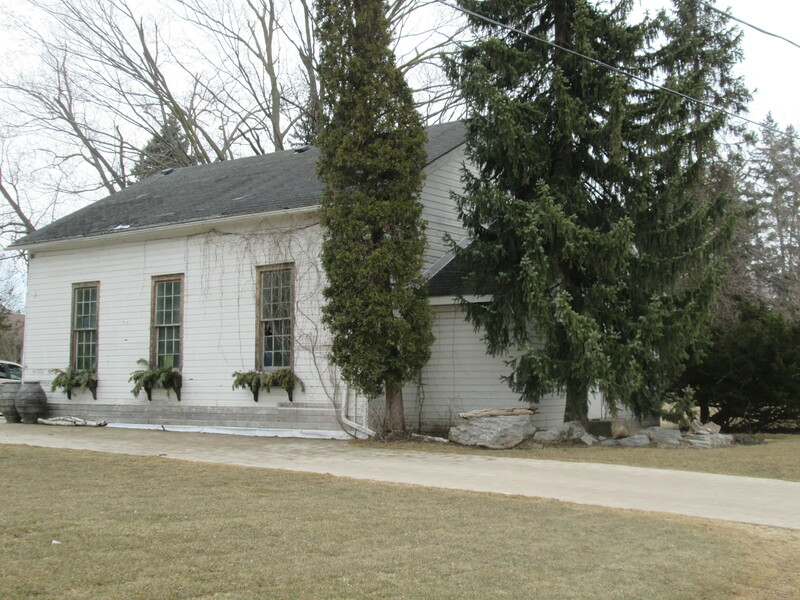 The Primitive Methodists built their church north of Elgin Mills road on the east side of Woodbine Avenue around 1830. Their cemetery remains but the church is gone. 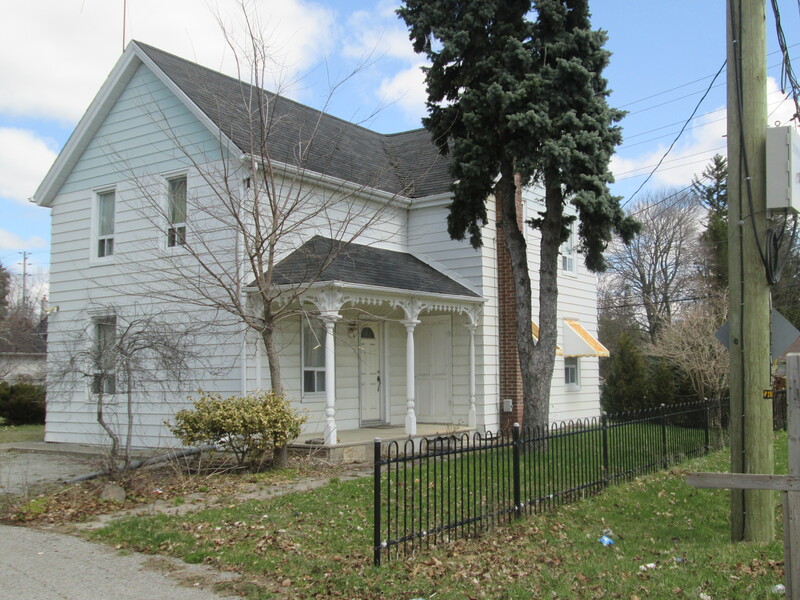 William Hatton was the first leader of the congregation and built his first house at 10754 Woodbine avenue in the 1830’s when the road was known as 3rd line. 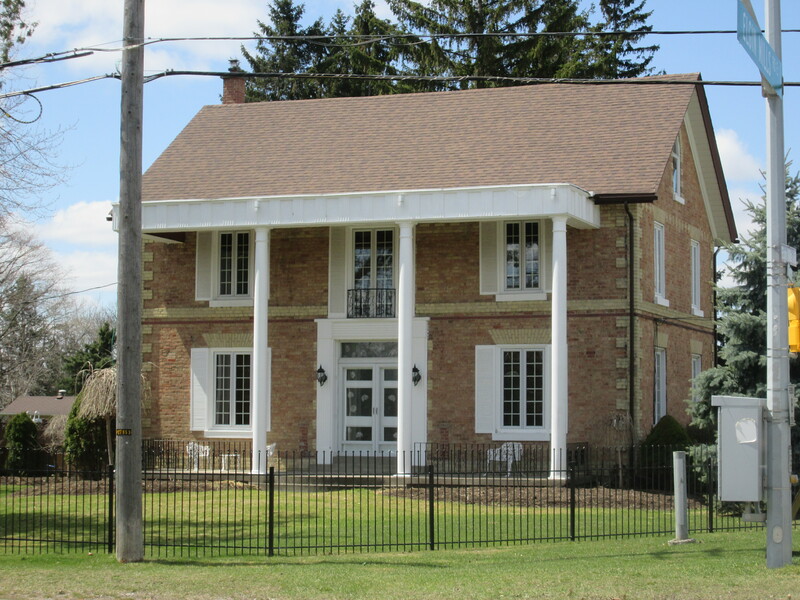 About 1850 Hatton built the house at 10761 Woodbine road. A carpenter named Jacob Baker owned the house in the 1880’s and he added a veneer of patterned brickwork as well as a veranda. 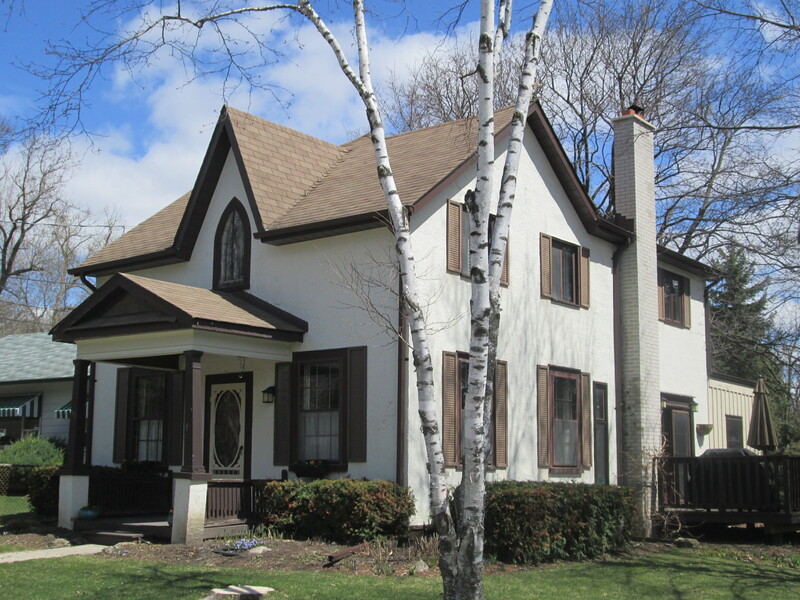 He replaced the original 6 over 6 windows that were typical of mid-1800’s small panes of glass to the 2 over 2 windows. During the mid-20th century Gord Mortson operated a bus line from this location. The outline of the veranda can still be seen in the picture below. 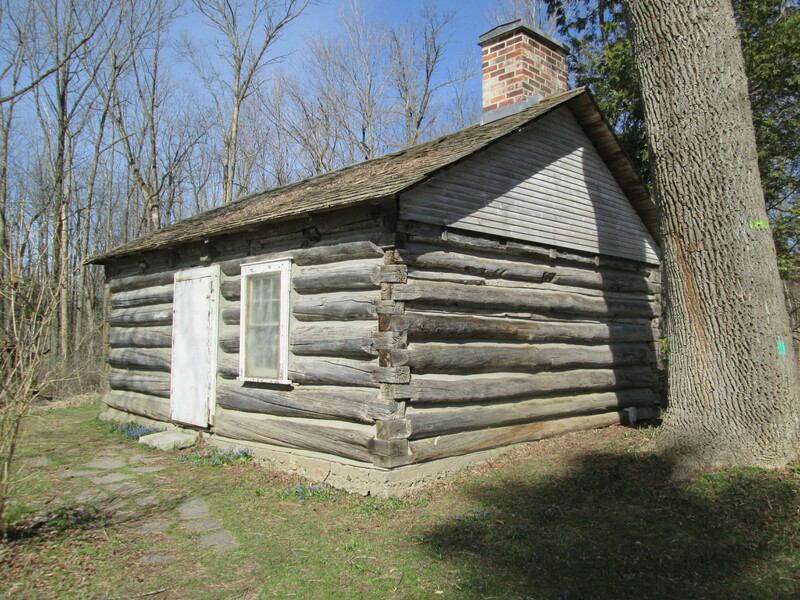 The Weslyan Methodists built their first building on the west side of Woodbine, south of Elgin Mills road around 1845. After a new building was constructed this was sold to William Frisby who used it as his blacksmith shop for many years. 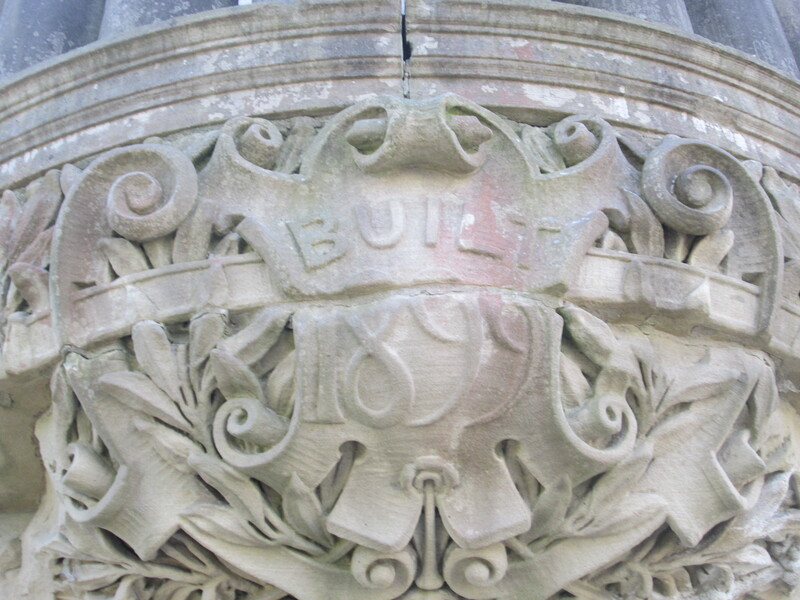 It now stands at the back of the cemetery where it is being restored. 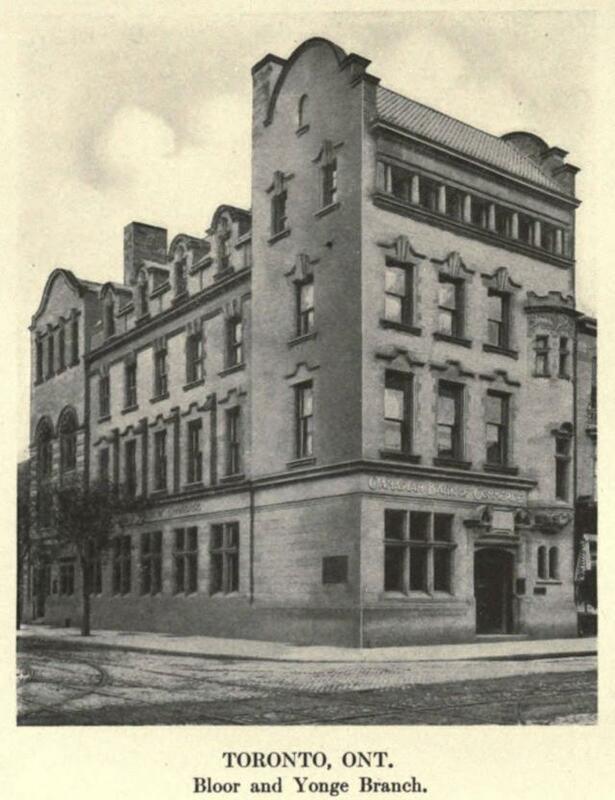 In 1880 a new brick church was built and the old one moved off site. 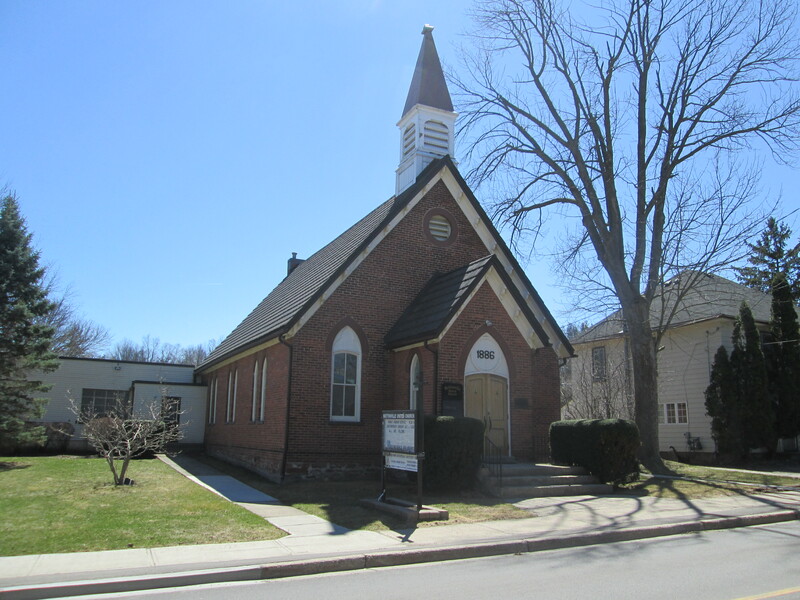 In 1925 the Methodists were part of a four church merger that created the United Church. 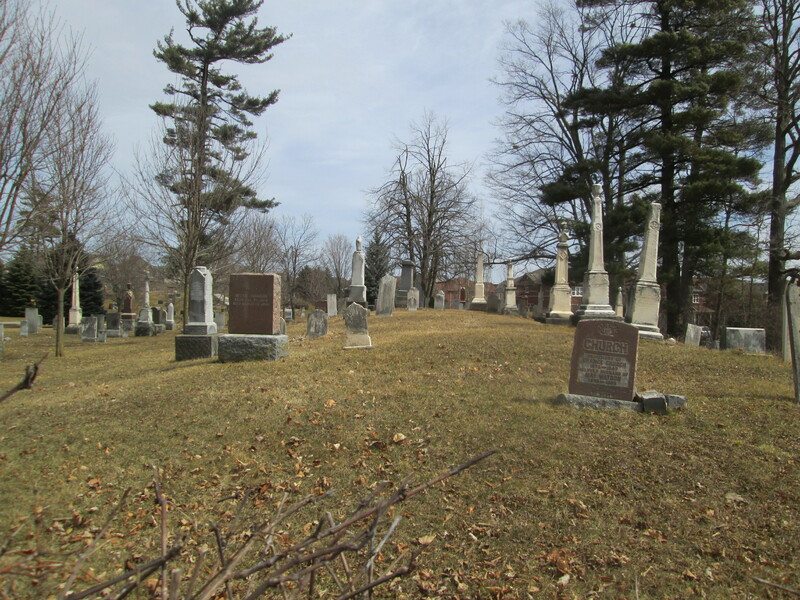 This is how both cemeteries in town came to be under the control of the United Church. Victoria Square was typical of small cross-roads communities that served their local farmers. People lived there for generations and everyone knew everyone else (and their business). William Boynton is shown in the 1901 census as the town butcher. William’s youngest son Charles Stanley would carry on in his father’s business renaming it C.S. 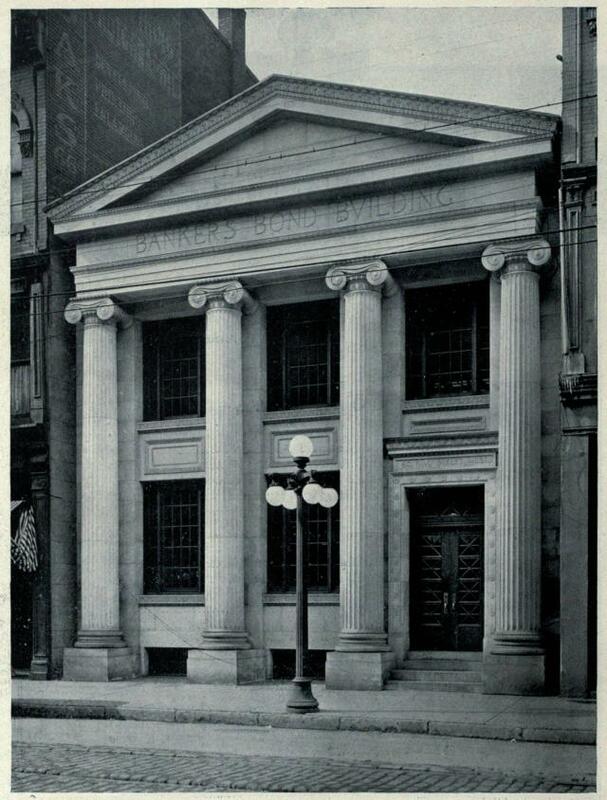 Boynton and Sons. William and Donald bought the business when C.S. retired and their children also worked there. After four generations of Boyntons worked there the business was sold and a butcher still continues to operate it today. 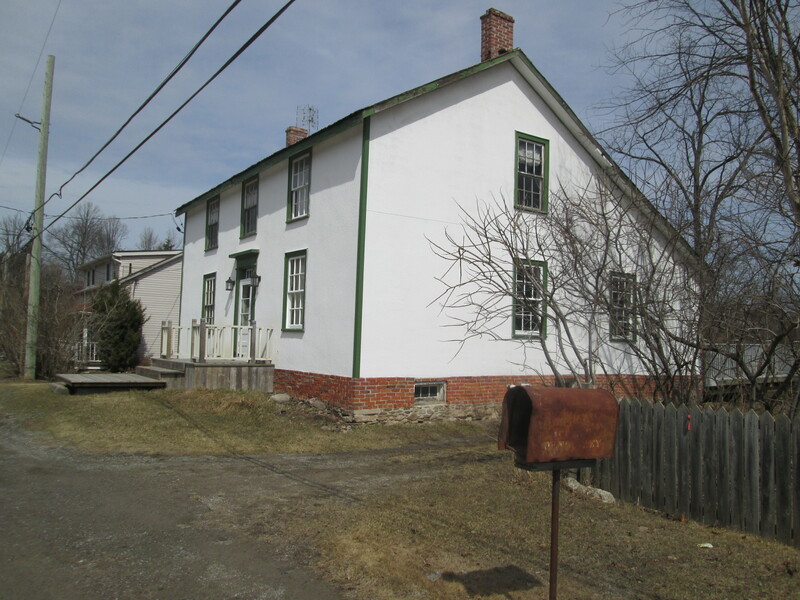 The picture below shows the first Boynton house built by William in the 1850’s or 60’s and was occupied by the family into at least the 1980’s. The buildings of the butcher shop were expanded in the 1960’s and can be seen in the rear of the photo. 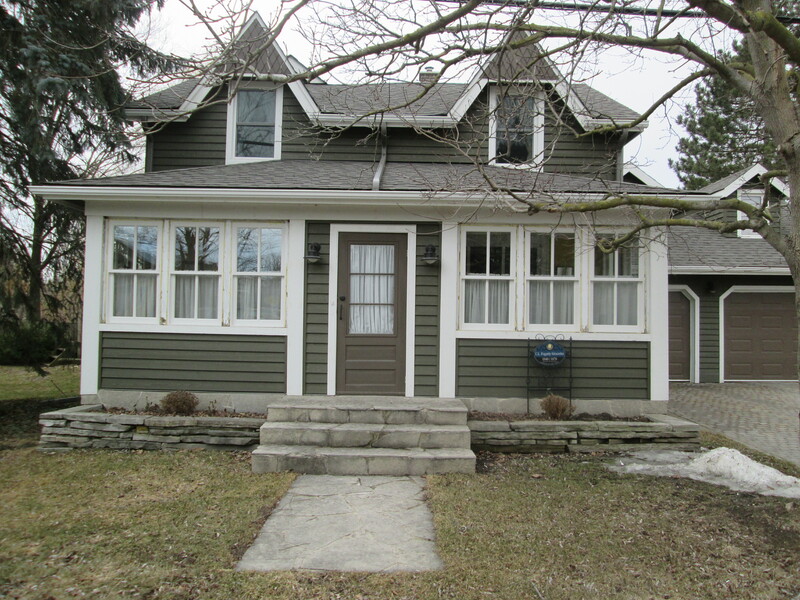 This house is also in front of the butcher shop and was built by William’s oldest son Herman, likely in the early 1900’s. Charles Stanley lived here for a time and eventually it was split into two apartments, both of which were occupied by Boynton families. The property on the south east corner of town is lot 25 con. 4 and was owned by Thomas Frisby (b. 1851). His father, John (Thomas) Frisby (b. 1822), had emigrated in 1850 and farmed the lot before retiring. Their house and drive shed are shown on the historical atlas above and stand today on Victoria Street. The building of a barn was also a community social event where the structure would be raised in a matter of days. All the men in town would gather to build the barn and their wives would prepare food and swap stories. The picture below is of a barn raising on the Klink property just south of town. 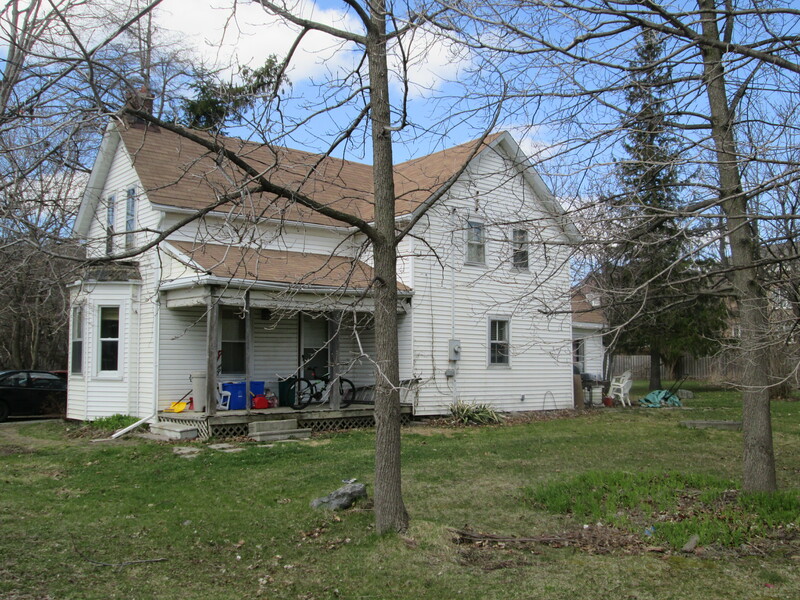 Notice the near identical form of the house to the Frisby one in the previous picture. Take away the chimneys and veranda’s and you have twin houses. The town carpenter’s handiwork. William Frisby (b. 1855) left the farm to his brother Thomas and became the town blacksmith, a position he held for forty years. 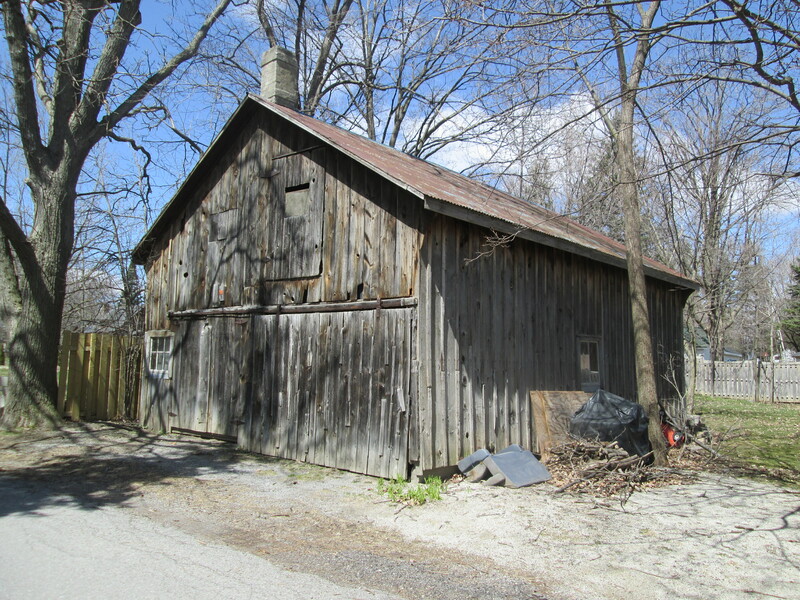 His business was so successful he hired another blacksmith who lodged with him and was paid $276 in 1901, Frisby’s shop was located at 2992 Elgin Mills and his house remains in use today. John Rowbotham was the town carriage maker at the turn of the century. Like many local businesses his son worked for him as a carriage painter earning $240 in 1901. 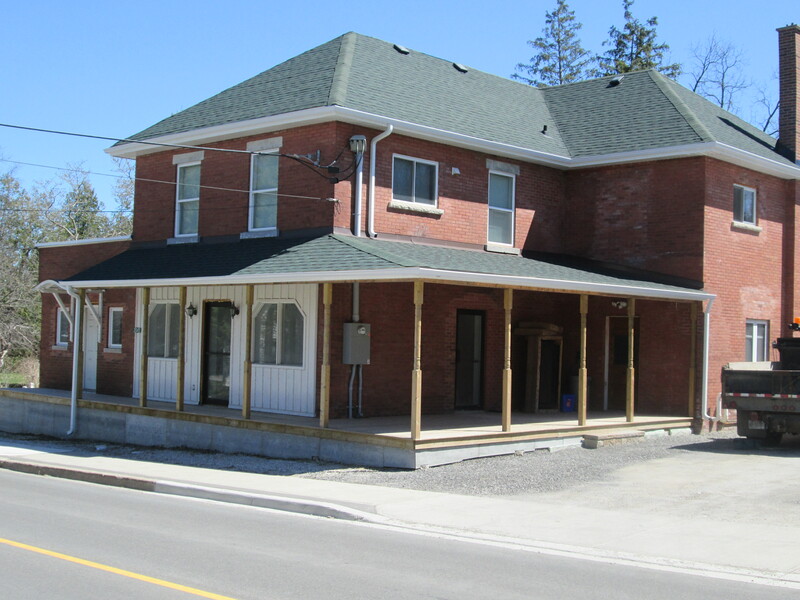 Their business was at 2972 Elgin Mills where the shop stood in the open space beside the house. True to it’s small town heritage Victoria Square has several barns in what would have been it’s downtown. This one was William Macey’s workshop. This house has had many uses over the years. In 1853 Thomas Farmer operated a cobbler shop here. James Stoutenberg bought it in 1860 and converted it to a general store where the post office would later be housed. 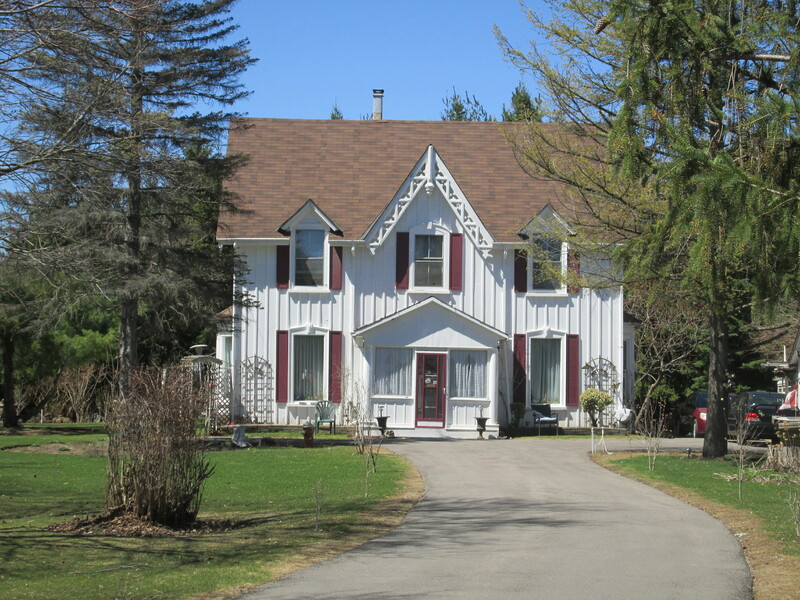 The farms to the north of town are being developed for townhouses including the property of George and Isabelle Pear. 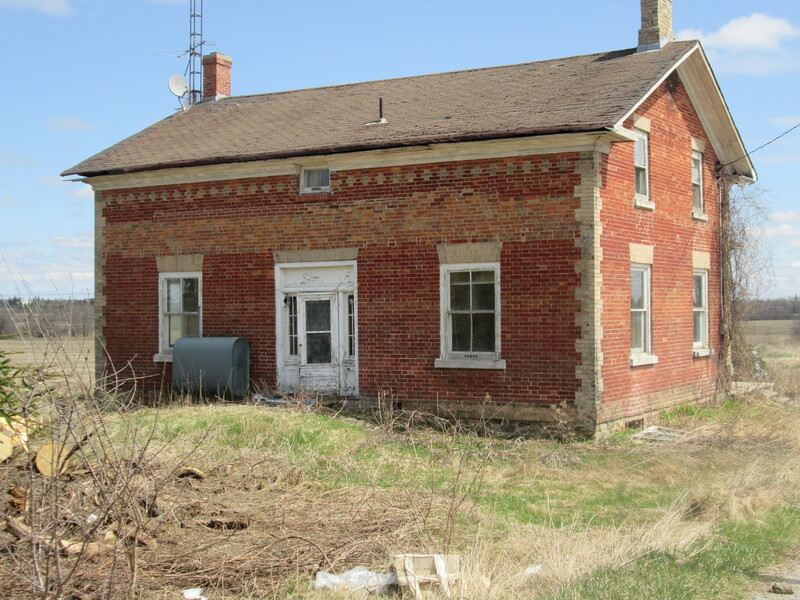 Their late 1840’s home is slated for restoration. 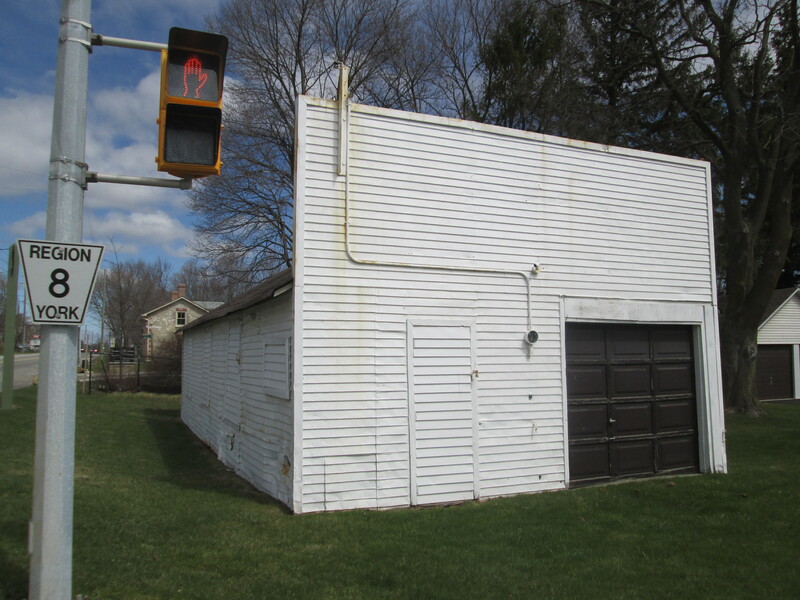 An old garage which formerly contained two gas pumps stands at the main intersection. 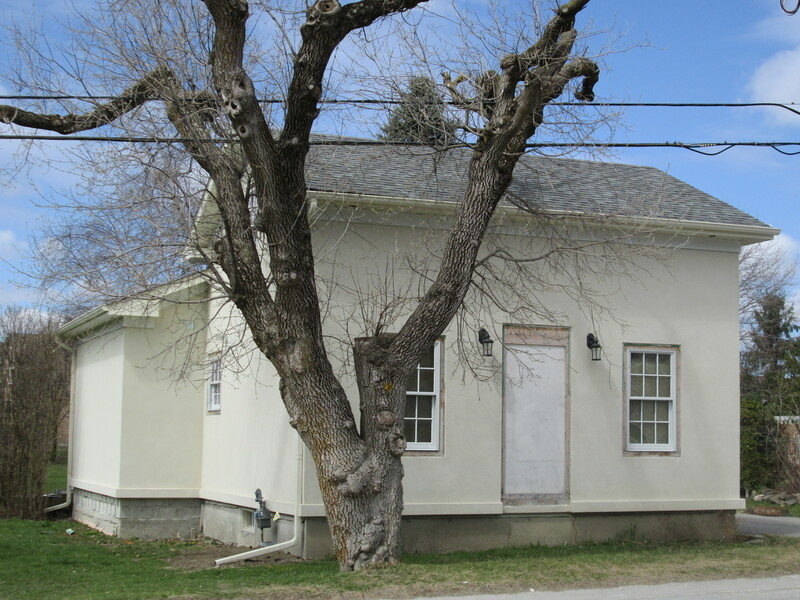 This was Louis Stoutenberg’s garage and his house stands beside it. It sports a false square front and evidence of several car impacts on the side of the building. 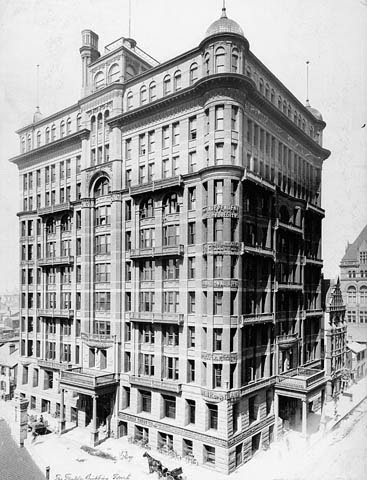 There are 22 buildings in Victoria Square which are either listed or being considered for heritage preservation. Thanks to Deborah Boynton Robbilard who’s great grandfather William was the butcher at the turn of the last century. Her insights into the community were invaluable in preparing this brief history. 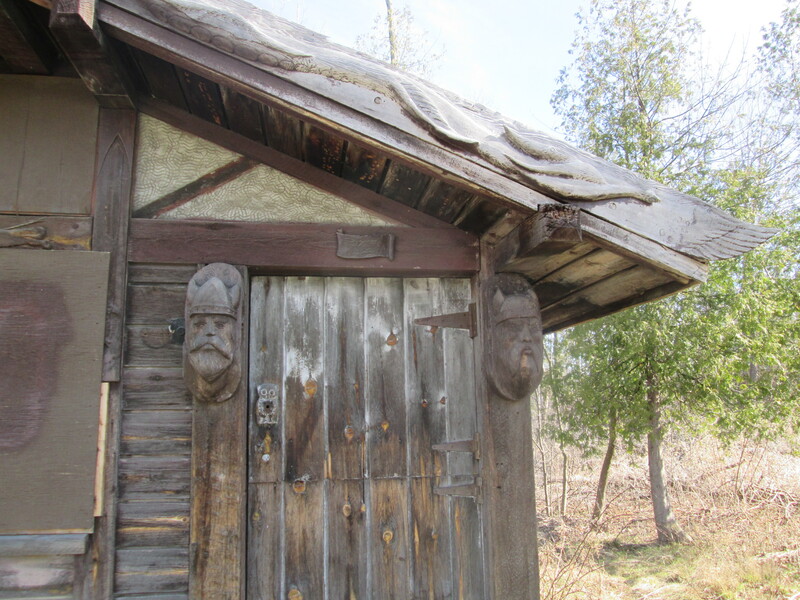 This entry was posted in Toronto Historical Buildings on April 28, 2015 by hikingthegta. Over the past year I have posted over 700 photos taken in various parks around the Greater Toronto Area (GTA). Hiking through diverse parts of the city one thing is common, there is very little litter in the parks. This is not the case for the park on the south east corner of Finch Avenue and Dufferin Street. I don’t know if it has a formal name, I have seen Dufferin Park on some maps, but I feel it should be renamed Garbage Park. Have a look at the pictures below and see how sick you feel. Then re-post this where the most people will see it until we get the attention of the city. 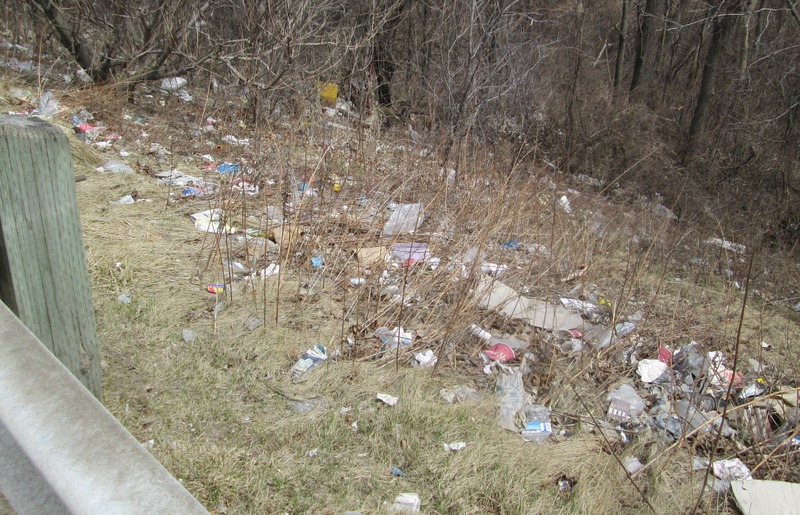 Walking down Dufferin along the side of the ravine on my lunch I was disgusted at the amount of garbage. 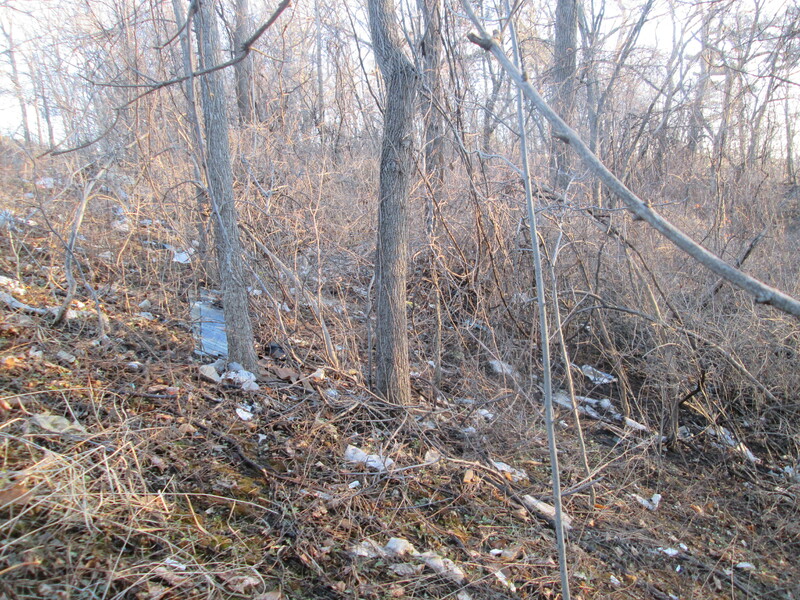 I know from working in the area that the city never cleans this woodlot. 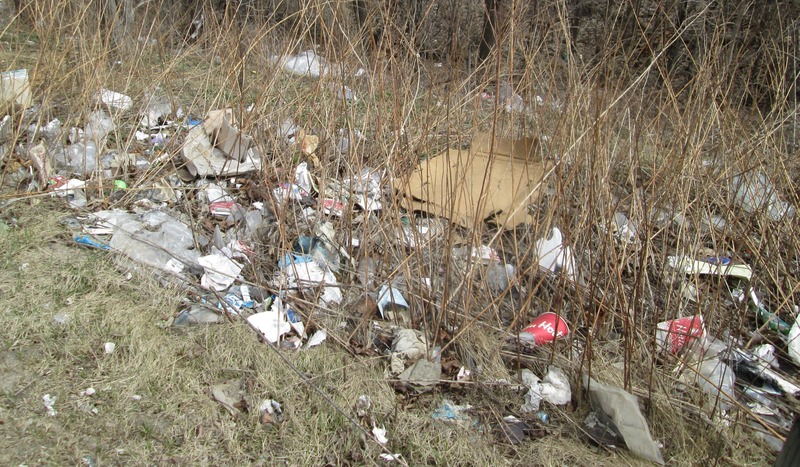 The garbage runs the entire length of this park along both Finch and Dufferin streets. This is the view from the street into the ravine. 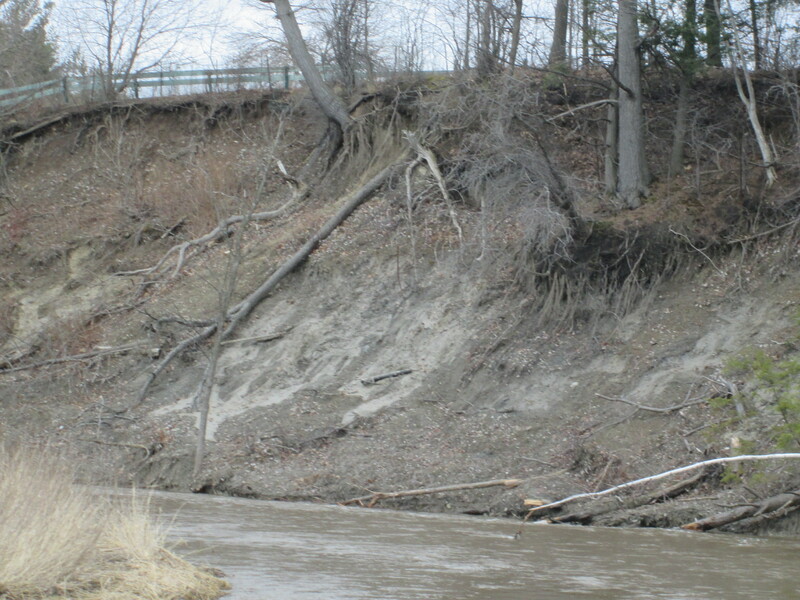 There is an environmental disaster rotting on the hillside and leaching into Dufferin Creek and then the Don River. 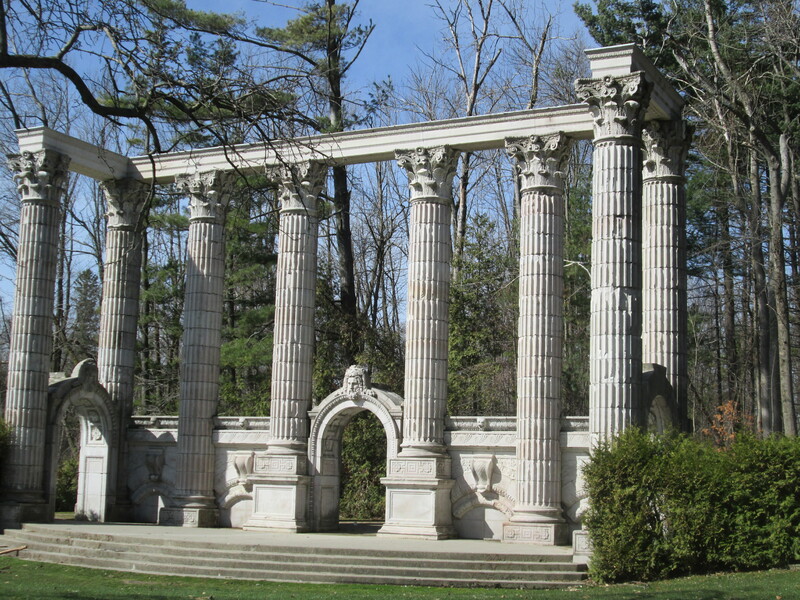 Toronto has a beautiful park system in our ravines. This should also be a part of that network of wildlife habitats. 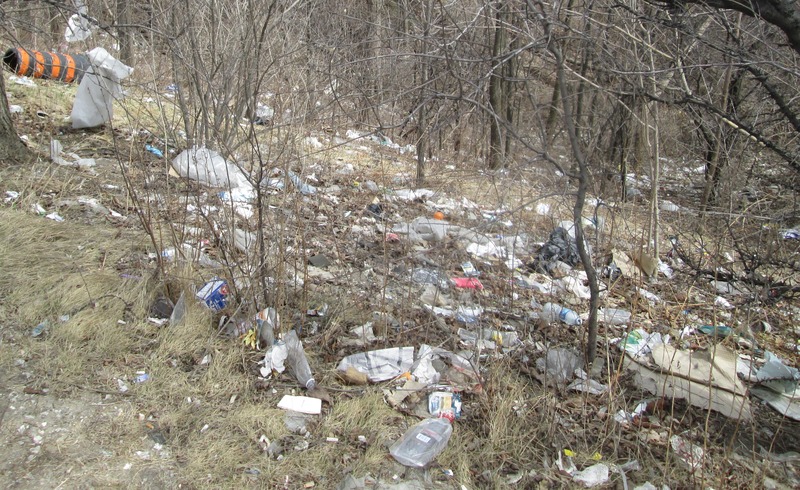 Toronto is busy cleaning up for the 2015 Pan Am games why not invest a bit somewhere other than the downtown core? That isn’t snow in the woods, it hasn’t melted all the years it’s lain there. If you think the city’s neglect of Garbage Park needs to end please post this where people will see it. Spread it around Facebook. Email it to your city councilor. The more people requesting action the better. I would love to come back here and show pictures of the cleaned up park. There is a history here and the foundations of at least four former homes. There’s a better story waiting to be told. 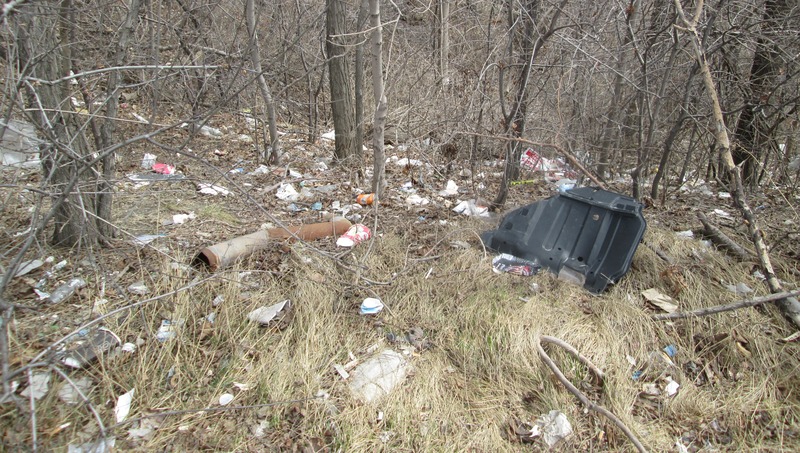 This entry was posted in Don River and tagged Dufferin Creek, Garbage in park on April 14, 2015 by hikingthegta. Winter has a way of hanging on and at 3 degrees we were being subjected to small pellets of ice as we started out. Eldorado Park is the next stop northward on the Credit River following the visit to Churchville last week. 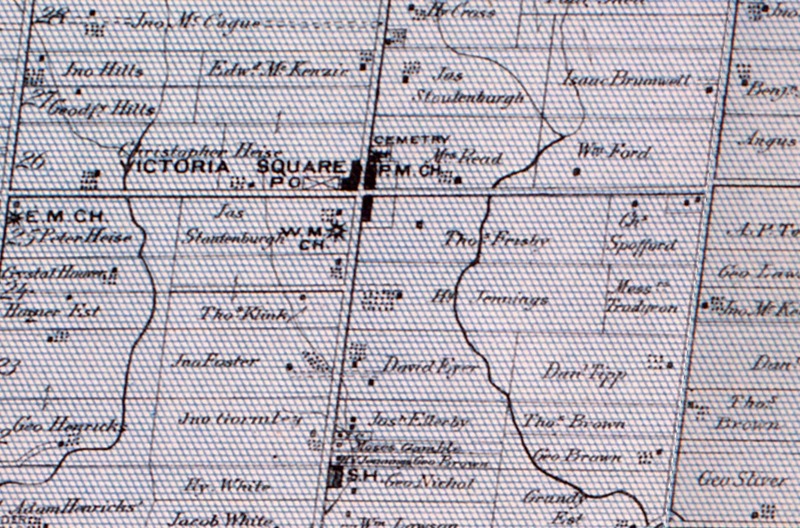 Eldorado park sits on lots 2 and 3 in the 4th concession west in Chingoucousy Township in what is now the city of Brampton. Lot 2 was settled by Jacob Snure who built a grist mill which he called Eldorado Mills. For lot 3, Mary Anne Forest is shown as a saw mill owner, likely after the loss of her husband. The area has had several owners since this time. In the 1877 historical Atlas the property is shown as belonging to Kenneth Chisholme. 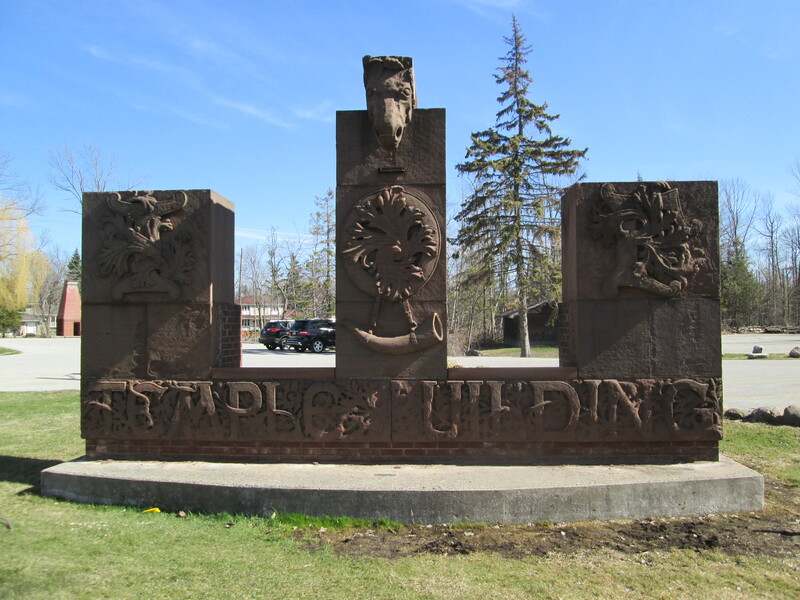 The mills closed and by the early 1900’s the area was converted to a large private park known as Eldorado Park. 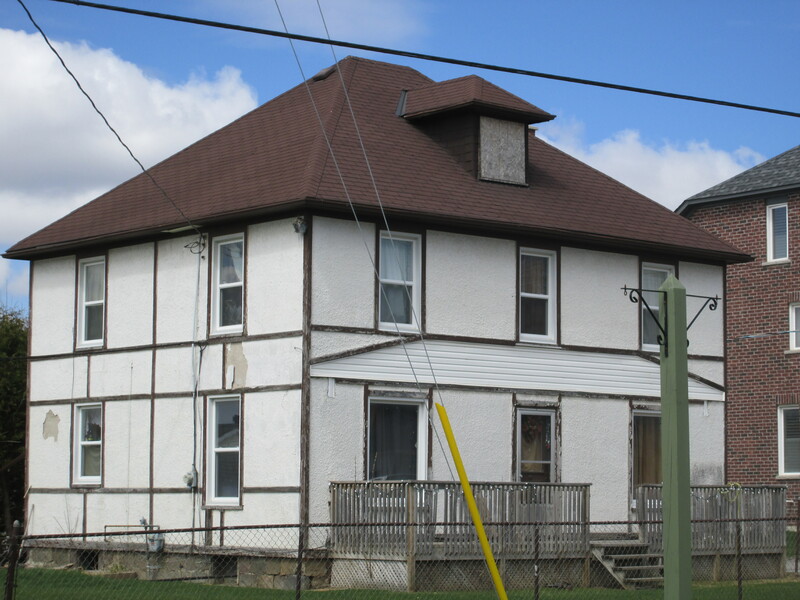 In 1925 the Canadian National Railway (CNR) purchased the property to try to breathe some life into the struggling suburban railway it had absorbed in 1918. They added a Ferris Wheel and Merry-Go-Round attempting to create the ideal day trip. We parked in the Eldorado Park parking lot and crossed the bridge to the west side of the Credit River. Just downstream from here is Brampton’s only outdoor swimming pool. When the Toronto Suburban Railway was completed to Guelph in 1917 it passed through Meadowvale and Churchville before reaching Georgetown. It passed through Eldorado Park which gave the railway the idea of creating it’s own tourist attraction to which it would provide transportation. The old right of way for the train tracks ran just along the edge of the swimming pool (long closed when the pool was built) and can be followed south from there. The picture below shows the old rail bed which, since the removal of the rails for use in Europe during WWII, looks much like any other hiking trail. The cover photo shows one of the streetcar-like trains unloading passengers at Eldorado Park. 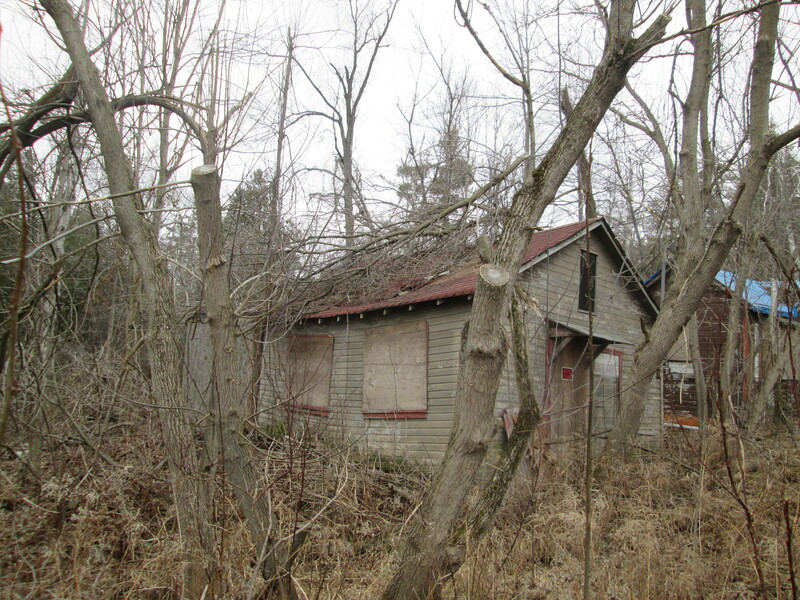 Along the old rail corridor we decided to follow a small ravine to investigate an older building. Before we reached it we came across an old soda bottle. Polar Beverages was founded in 1882 in Worcester Massachusetts. Now in it’s fourth generation, this family owned beverage company is the largest independent bottler in the USA. Polar Beverages got themselves sued in 1994 by showing a polar bear throwing a Coke in a garbage bin marked “Keep the Arctic pure”. 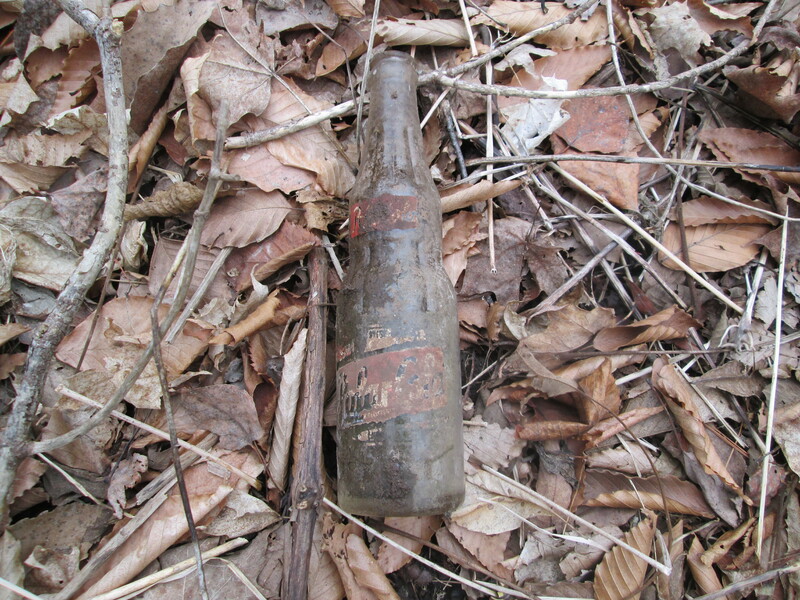 The bottle in the picture below is dated 1948 and was made in Salem Mass. 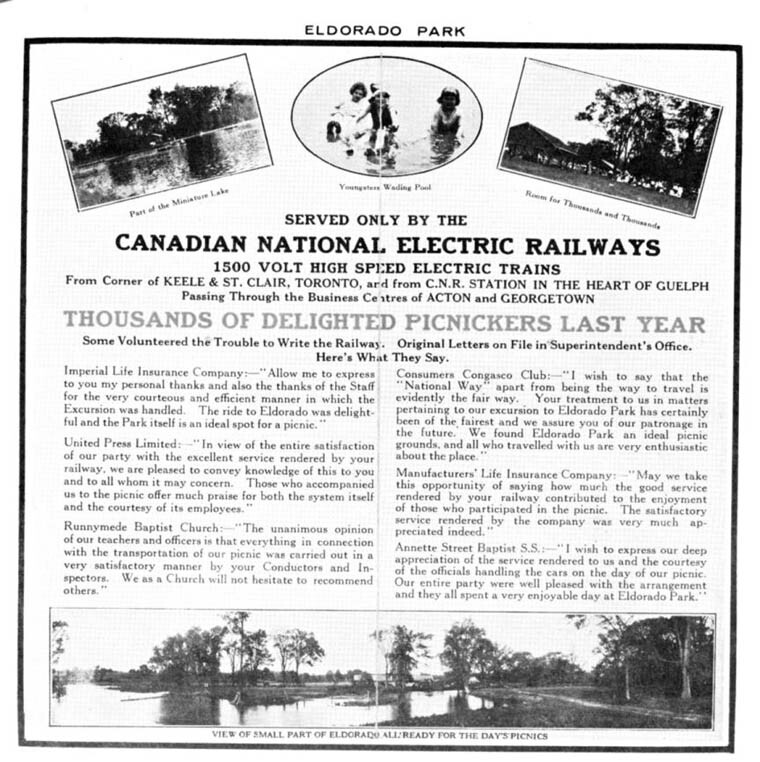 During the Depression the CPR determined that rail line and ultimately the park were too expensive to maintain, closing them in 1931 and 1936 respectively. 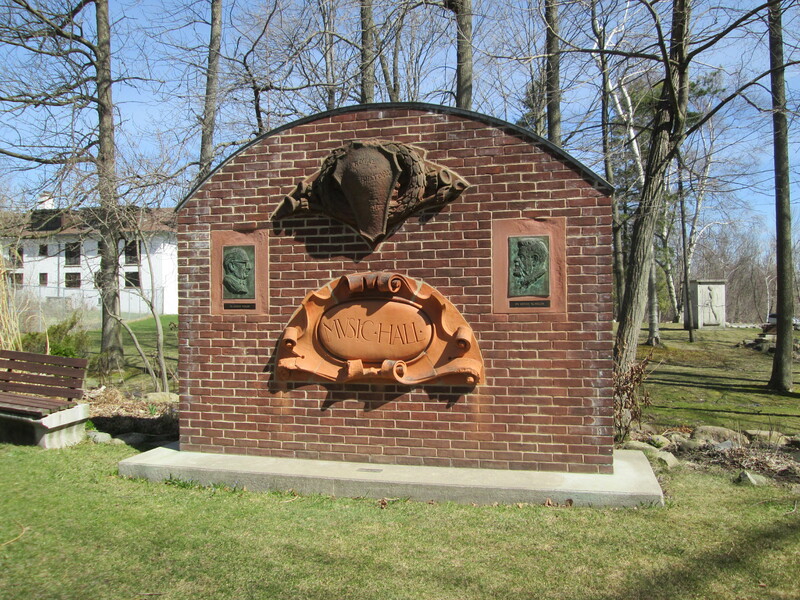 The park area was purchased by a Jewish group for a summer camp called Camp Naivelt (New World). For the first few years campers used tents but during the 1940’s and 50’s about 90 small cottages were built in what would be known as Hill 1, 2 and 3. We had wondered into Hill 3 and found The Ritz and a small building holding a water tank. Beside them stand two abandoned buildings that were the children’s infirmary. The roofs are caving in and these will likely be pulled down before long. 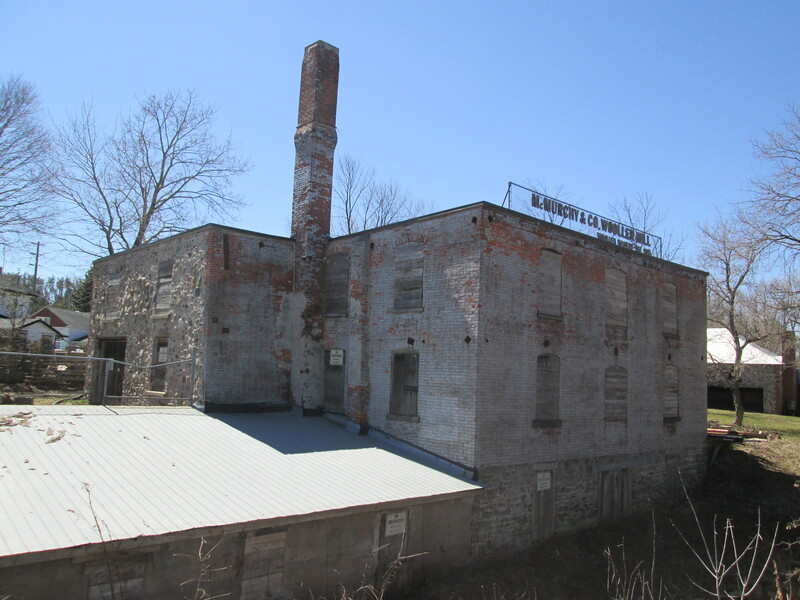 The no trespassing sign on the building applies to the whole property and the owners ask that you take this article in the spirit of preserving history and that we do our part by not entering the property. Beyond here the hillside is oozing mud and quickly becomes impassible. The old rail line ran across the side of this embankment but much of the remains now lie in the bottom of the ravine under the muddy water. 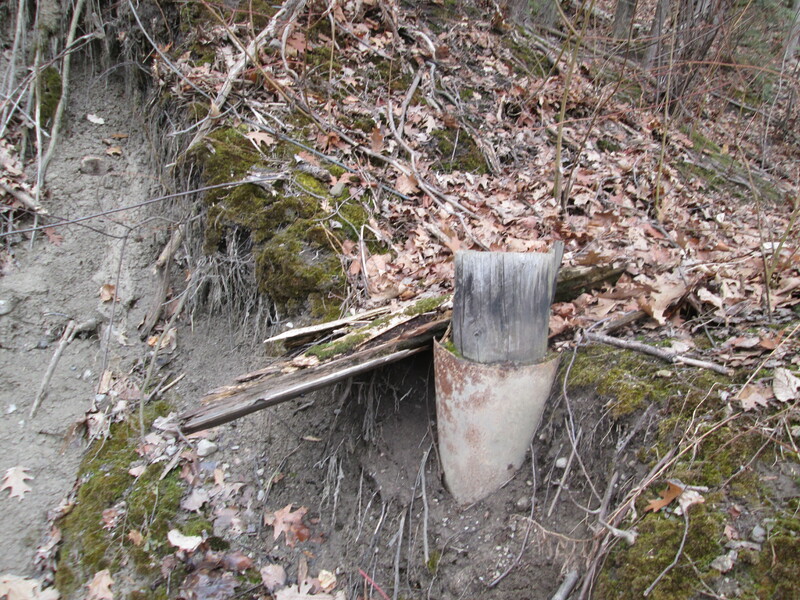 Parts of rail ties may be strewn along the hillside. We returned to the bridge and crossed back to the east side of the Credit and started to follow it south. After awhile we started to find concrete scattered on both sides of the river. After passing a foundation for some former building we started to follow a concrete wall running somewhat parallel to the river and just inside an older earthen berm. Broken in several places it no longer holds the mill pond from Eldorado Mills. The view below is from inside the former pond looking out through the sluice gate. 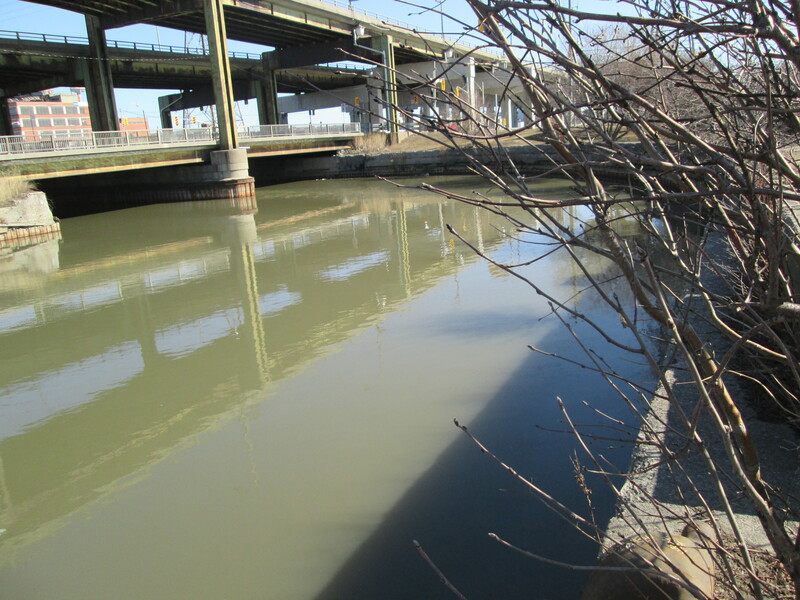 The disipator at the outflow of the sluice is rotting away. Even so, the effect can be clearly seen in the picture below as it causes the water to lose kinetic energy. The water is churning white after dropping over a small waterfall. As it passes each row of posts it becomes noticeably calmer. By the time it passes the fifth row it is almost totally smooth. 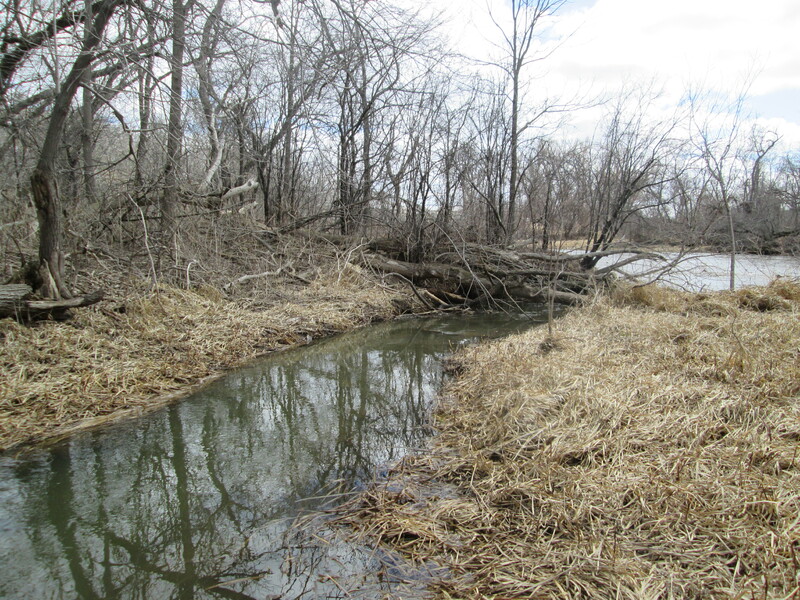 When we came to cross the tail race on our trip south we found that the only way was use the fallen tree just before the river. Someone had neglected to nail a hand rail on there for us like had been done at Playter’s Bridge on the Don River. 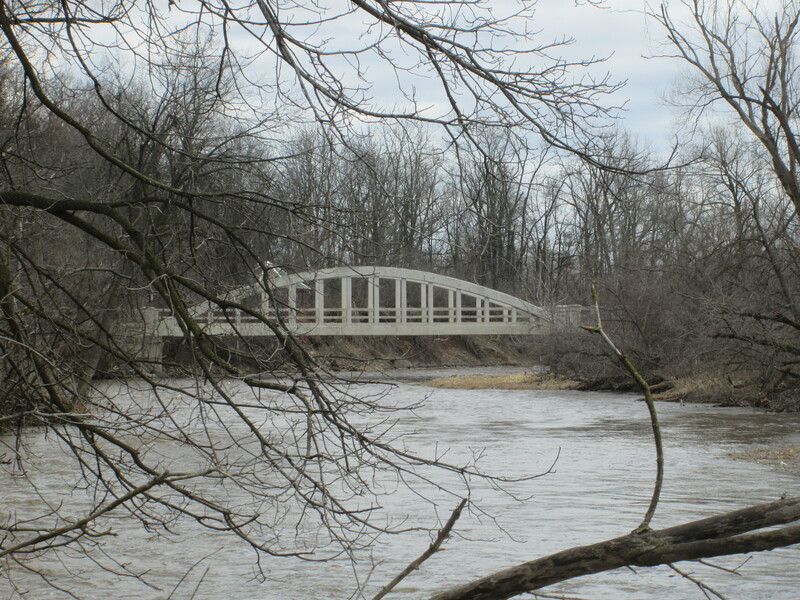 Built in the 1930’s the Creditview Bowstring bridge is one of only two bowstring truss bridges in Brampton and the only one still part of a public roadway. Along with the bridge in Churchville it is also one of only two one-lane public bridges in Brampton. It had fallen into disrepair and by 2002 it faced closure. 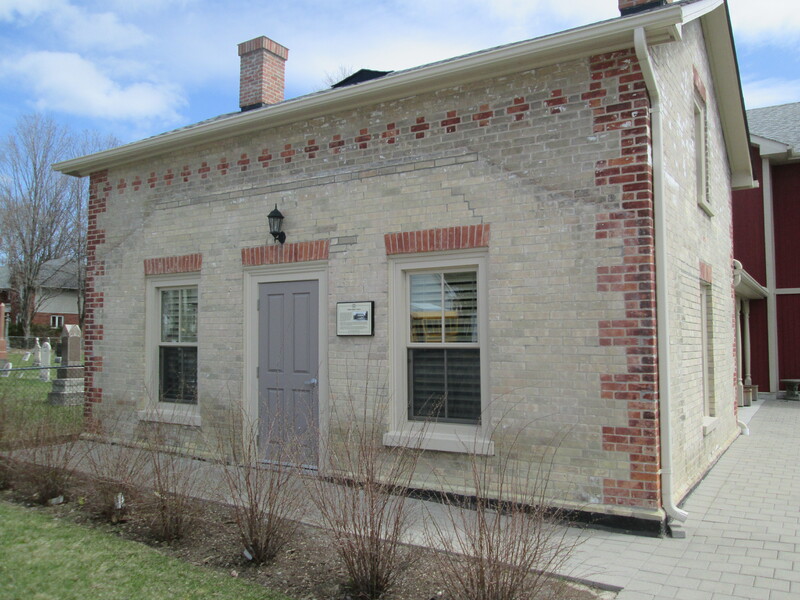 When it was given an heritage designation in 2003 it got a $700,000 makeover. Eldorado Park hosts families on picnics and dogs chasing balls these days but the history of a milling centre and an amusement park remains in the old right of way for the electric railway and the remnants of the mill pond and sluice gates. This entry was posted in Credit River and tagged Camp Naivelt, Creditview Bridge, Eldorado Mills, Eldorado Park, Polar Cola, Toronto Suburban Railway on April 13, 2015 by hikingthegta. 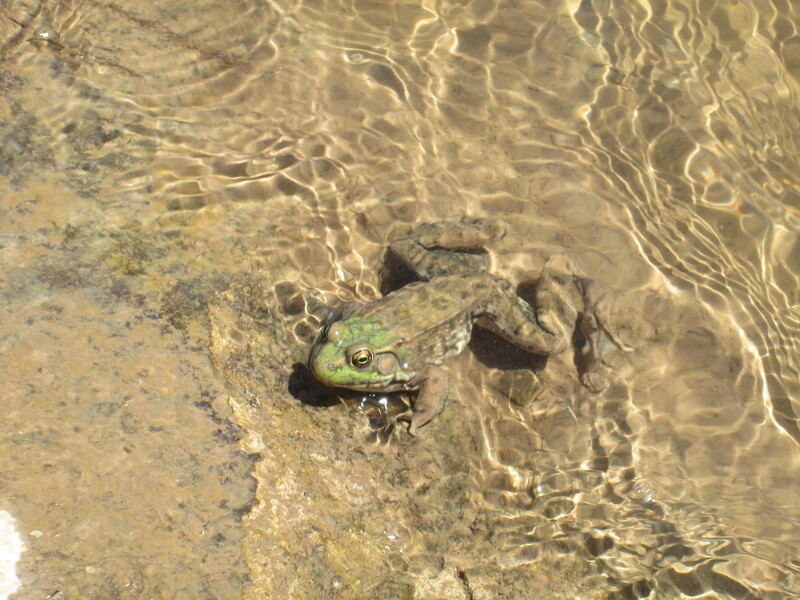 When York (Toronto) was founded in 1793 the Don River was home to a wide variety of wildlife. 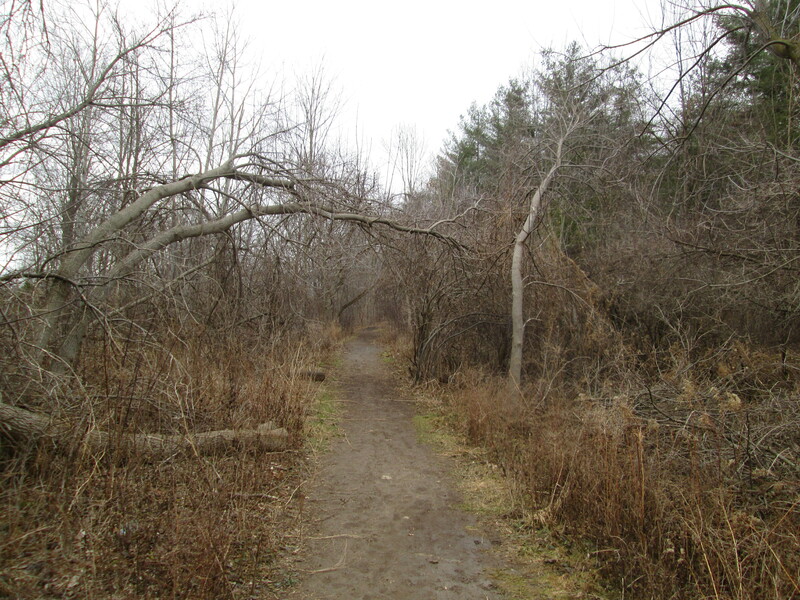 The lower Don snaked it’s way through the Ashbridges Bay Marsh before reaching the lake. At night the marshes were alight with small boats spear fishing large salmon. After a snowfall in the winter the frozen river revealed countless tracks from many different species. 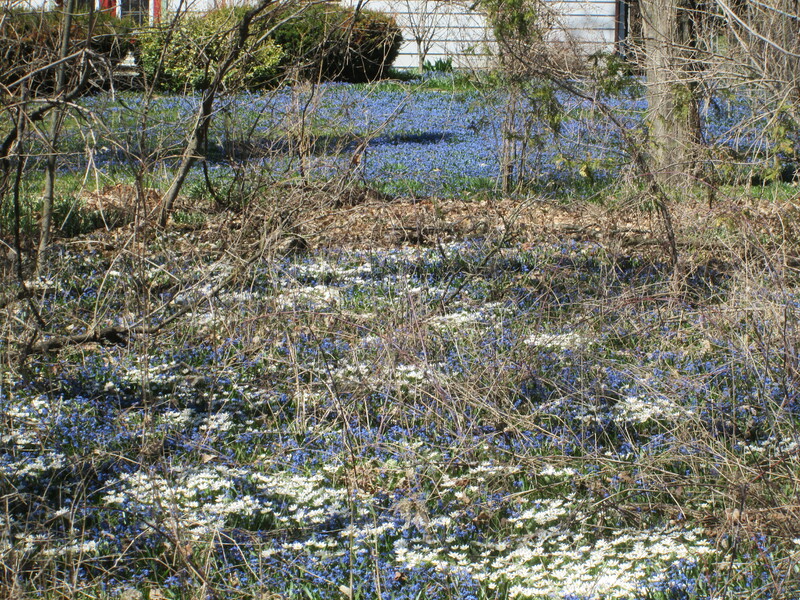 This past winter’s pictures show that this is no longer the case. The cover photo shows the marshes in 1909 before they started to fill them in. This portion of the river flows slowly because it has a very gradual slope at only 4 meters for every km it flows. Milling operations, industry and sewage caused the river to become horribly polluted by the mid 1800’s. 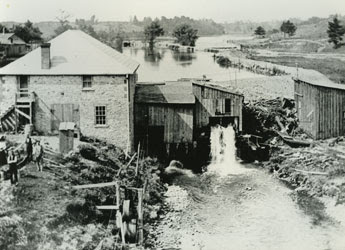 By 1890 the Don Improvement Plan had been implemented to straighten the portion of the Don river below Riverdale Farm. This channelized portion of the river would become known as The Don Narrows. What a change from yesterday. At 2 degrees, I didn’t end up carrying my jacket today. I started off at Riverdale Park where I used the pedestrian bridge to get access to the Lower Don Trail. 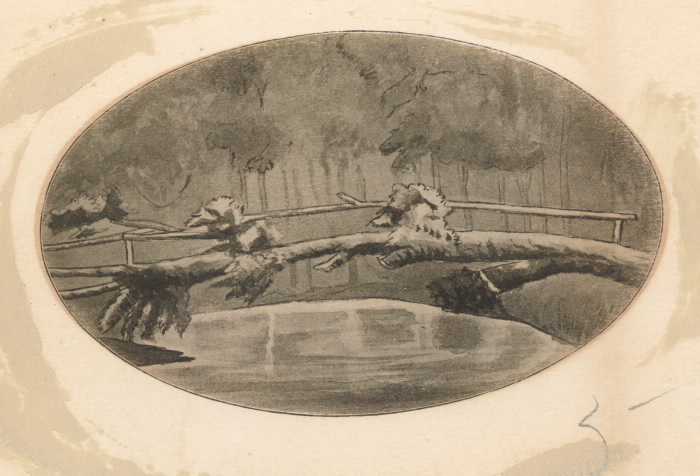 The first bridge across the Don river was a fallen tree with a hand rail attached which was known as Playter’s Bridge. The drawing below was made by Elizabeth Simcoe, wife the Lieutenant Governor, in 1794. It ran where Winchester Street bridge used to stand. 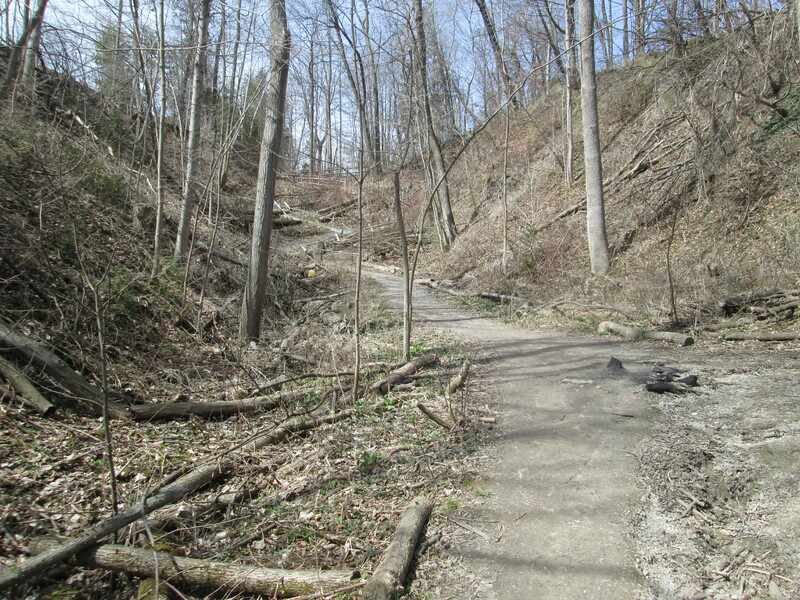 This was the starting point for my hike down the Don River. The final curve in the river, before the narrows, runs under the former Canadian Pacific Railway bridge. 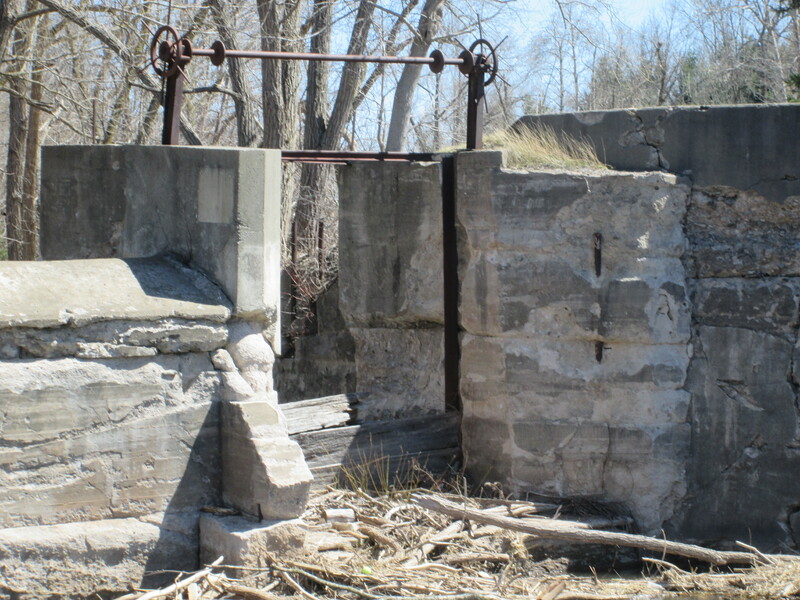 This abandoned bridge carried the Toronto to Montreal train out across the Half Mile Bridge. 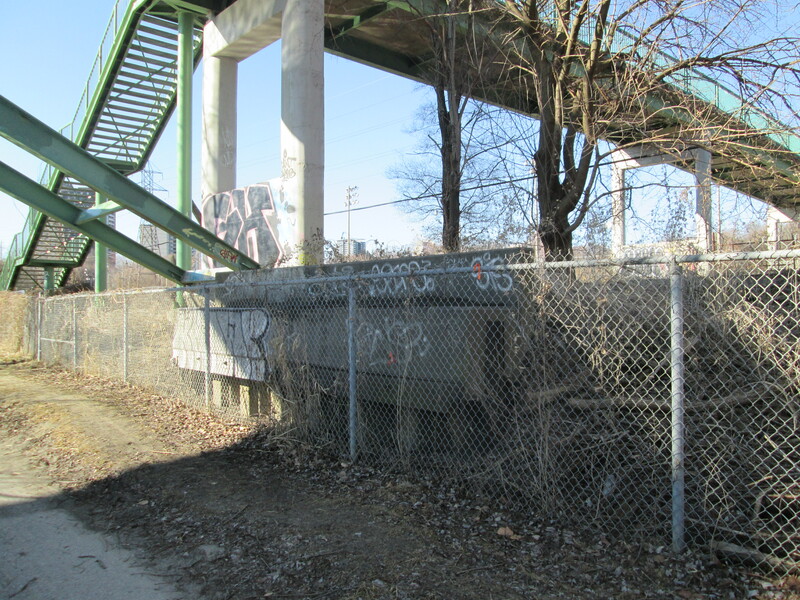 Just south of here is a pedestrian bridge that carries the Lower Don Trail over the river. The picture above was taken from this vantage point. The third bridge is the high green steel pedestrian bridge that backs onto Riverdale Park and Farm built in 1959. At the base of this bridge is the abandoned abutments from a bailey bridge that stood here previously. Princess Margaret visited Toronto on July 31, 1958. She was introduced to the city from this former bridge, of which the concrete abutments stand on either side of the river. The bridge at Queen Street replaces a couple of previous bridges. 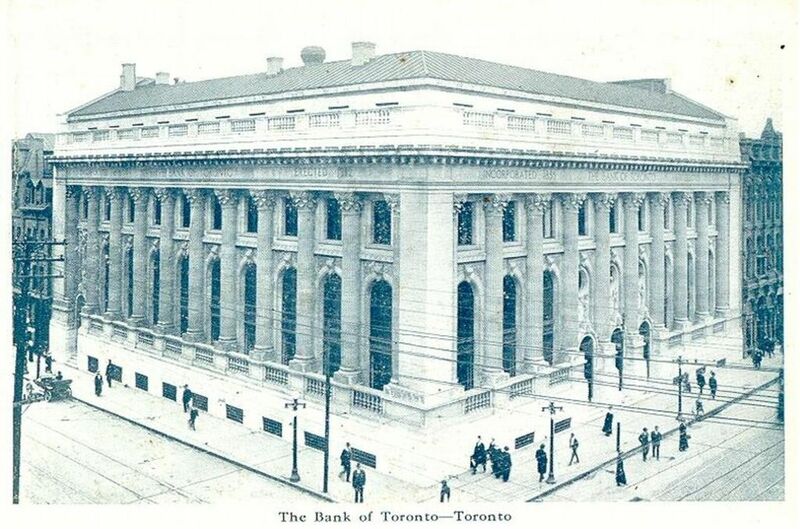 The first one from 1803 was designed by William Berczy, father of the post master in Toronto’s First Post Office and was a wooden draw bridge. Today’s bridge was built in 1911and contains the phrase “This River I Step In Is not The River I Stand In” above a clock. This phrase is taken from the Greek philosopher Heraclitus who is known for his doctrine of constant change. It was only added in 1996 and the clock has been broken since 2010. 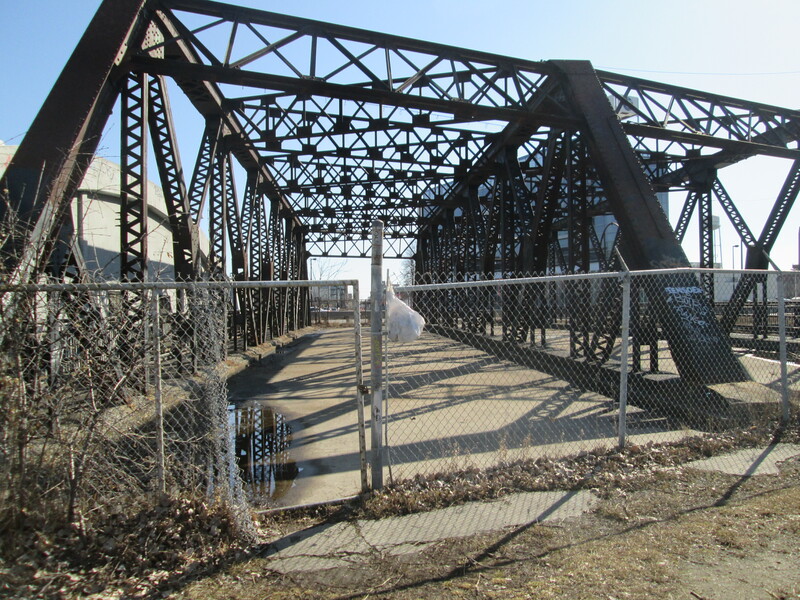 The Consumer’s Gas Bridge (now Enbridge) carries a 30″ gas main across the river. It was constructed in 1930 for this purpose and has never actually been used for either pedestrian or vehicular traffic. Consumer’s Gas used to operate three coal gas manufacturing plants in the city. Customers who are supplied from the Eastern Avenue facility have their gas carried across the river on this bridge. At the time that it was constructed the former wooden bridge for Eastern Avenue was incapable of carrying the weight. There is a current push to have the sides opened up so that it won’t become a dam during a flood, causing a Raymore Drive kind of disaster. The double span truss bridge that stands beside the Consumer’s Gas bridge replaces an earlier bridge that was damaged by ice flows in 1933. This was the former bridge for Eastern Avenue before the opening of the DVP in 1964 and realignment of Eastern Avenue. 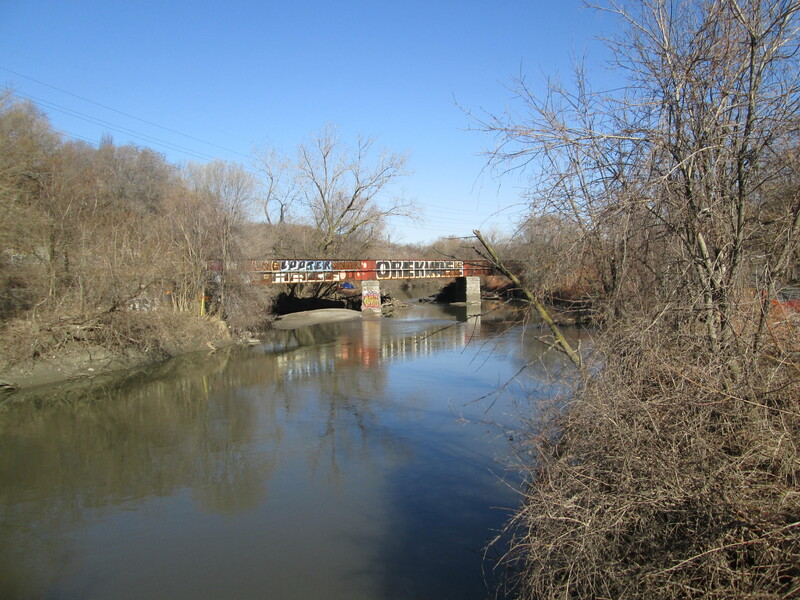 The first rail crossing on the lower Don was built in 1856 as part of the Grand Trunk Railway’s Toronto to Montreal line. In 1892 a new bridge was built on the existing abutments. In 1930 the present bridge was built on higher abutments just to the south of the previous one. The cut stone abutments from 1856 can be seen on the eastern river bank in the picture below. 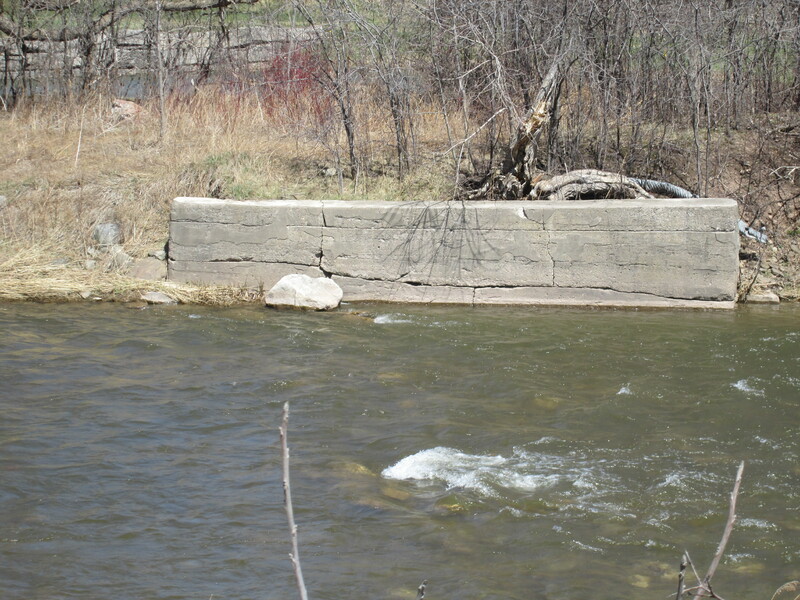 When the river was widened in 2007 for flood control purposes the west bank abutments were pulled up and used for erosion control and distributed as casual seating. 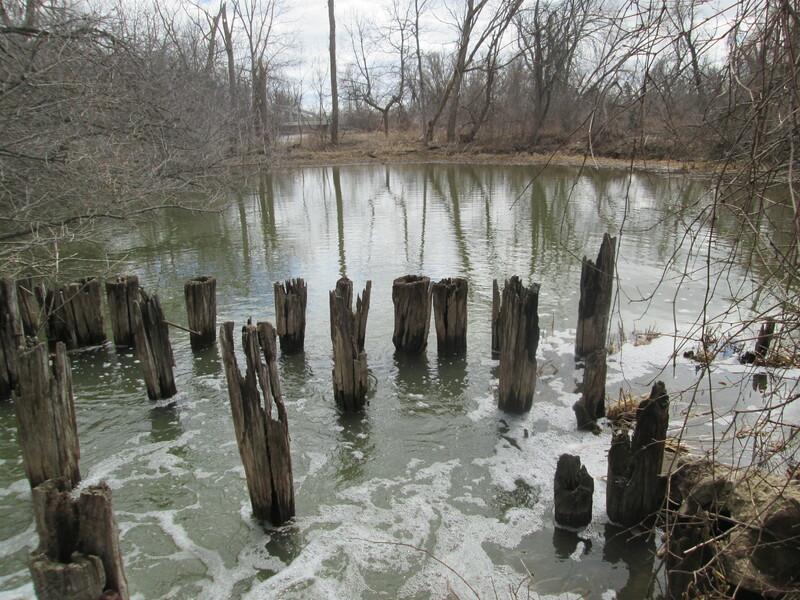 Cedar pilings that lined the river bank following the 1890 straightening of the river can be seen in the water on the near shore line. The last abandoned bridge before the harbour belonged to the British American Oil Company and was used to transport pipes across the river. It appears to have been closed when the DVP was completed in the 1960’s. The river makes a 90 degree turn after it passes under Lakeshore Drive as it enters Keating Channel on it’s way to the lake. The picture below is looking back toward the curve in the river with the road on the left. The British American Oil Company who owned the lands on either side of the river refused to allow access for the river to curve to meet the Keating Channel and so the right angled connection. 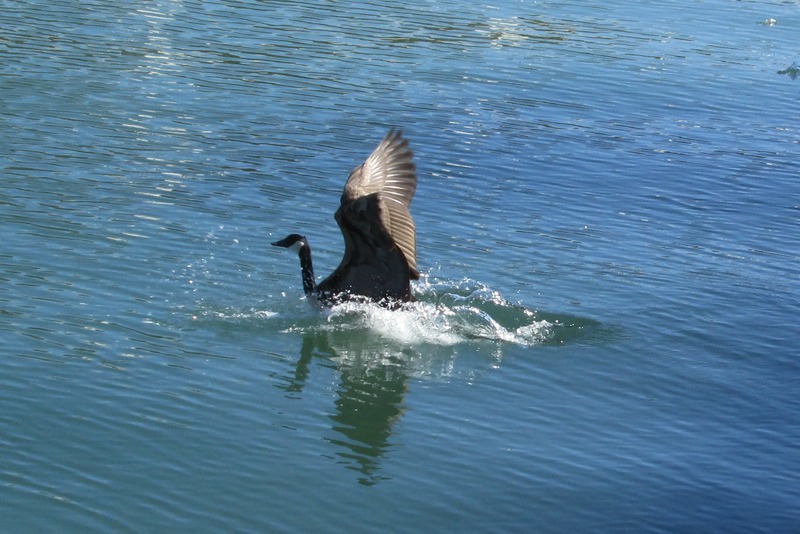 Along the Keating Channel, just before Cherry Street, I watched this Canada Goose jumping into the river. 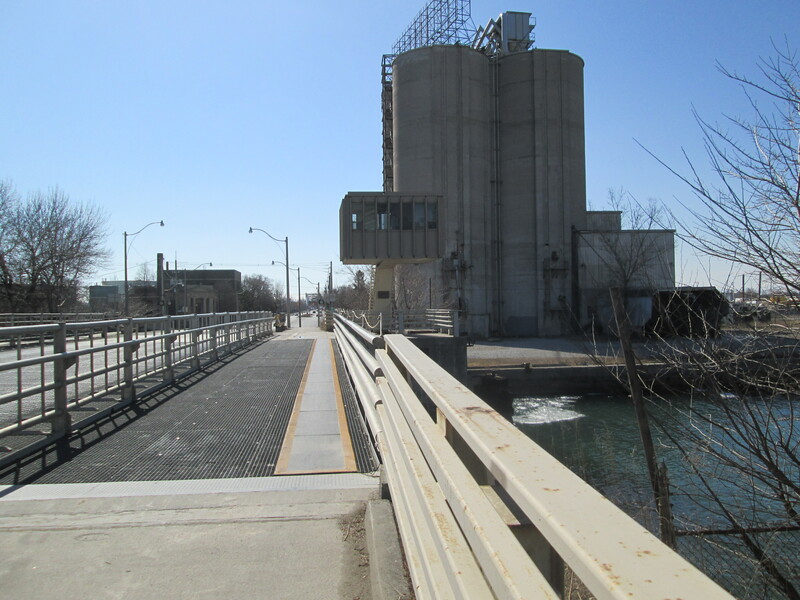 The only bridge to cross the Keating Channel is the Cherry Street bascule bridge. Built in 1968 it replaces an earlier swing bridge. 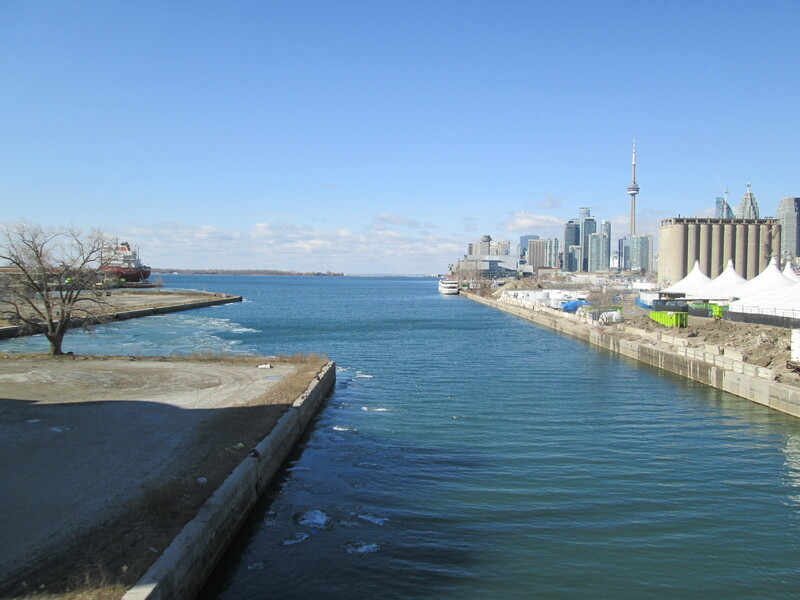 With plans to re-naturalize the mouth of the Don river a new channel will be created south of the Keating channel. 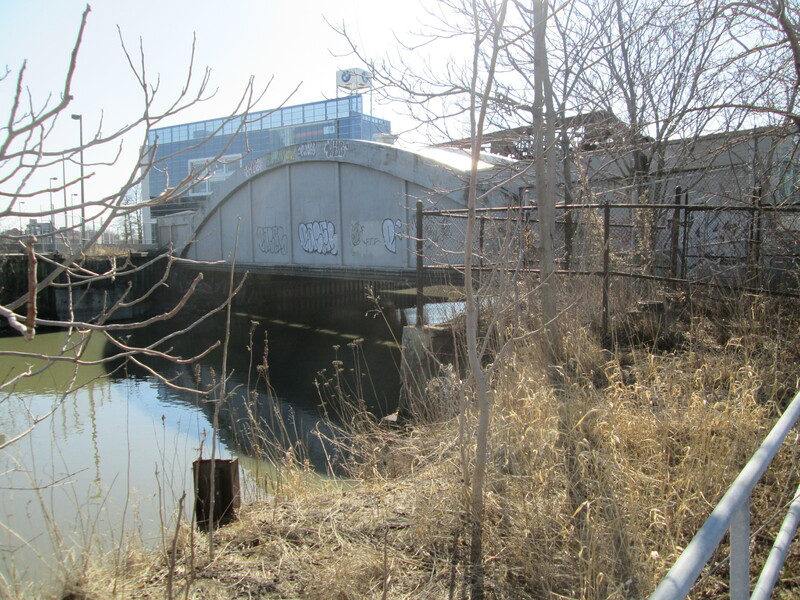 The Keating Channel will be retained for it’s historic value but this bridge is already scheduled to be replaced. Note the operator’s control booth elevated above the bridge on the far end. The mouth of the Don where it empties into the harbour as seen from the control room on the Cherry street bridge. 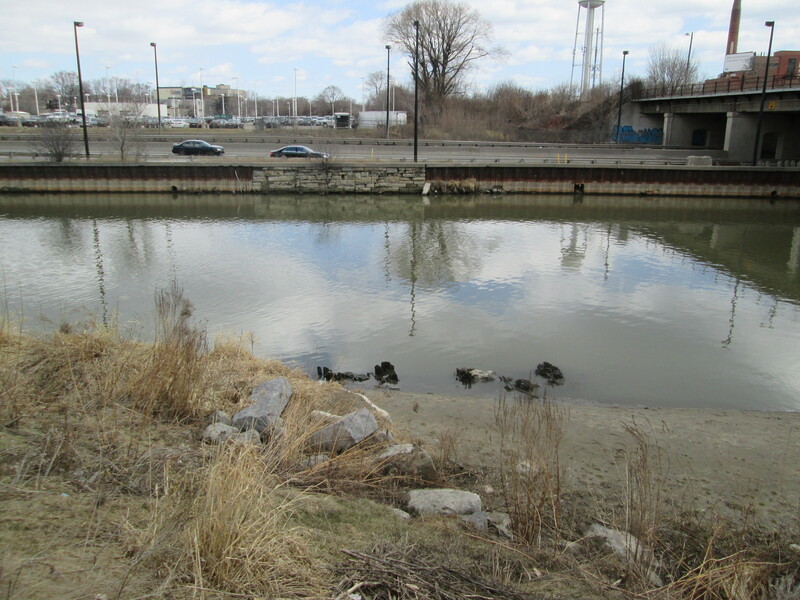 There is a plan to move the mouth of the Don river once again. The present discussion involves taking the river a little farther south and then running a more natural channel west to the lake. The areas around the new channel would be planted with trees and made into parkland. This strip of park would revitalize the Port Lands and reclaim a brown spot on the lake shore near downtown. 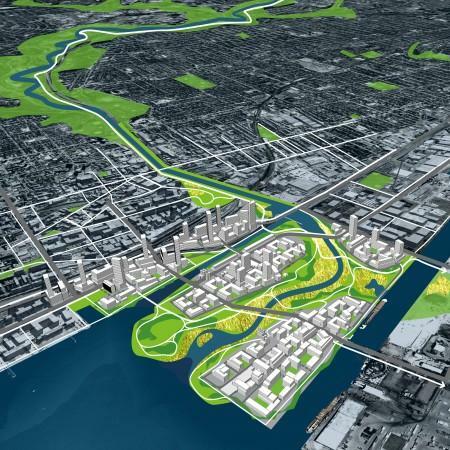 The picture below shows one of several proposals for the naturalization of the mouth of the Don River. 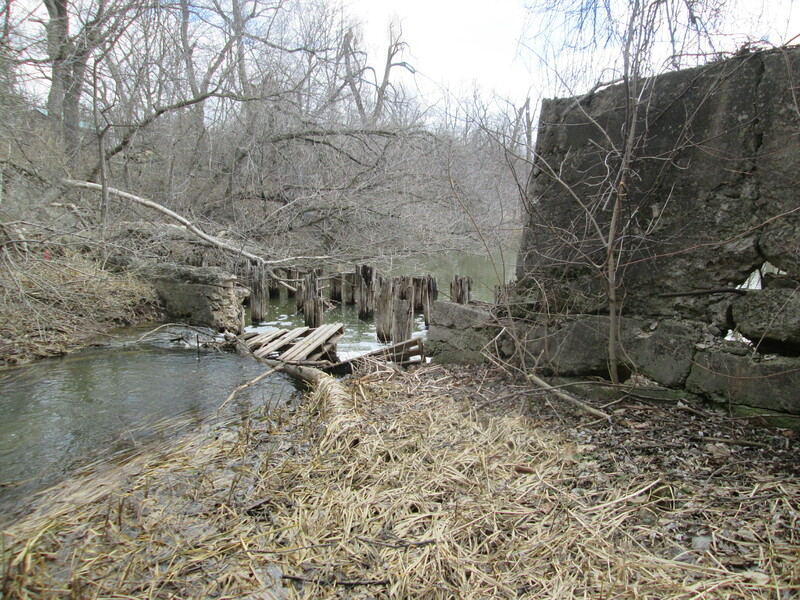 This entry was posted in Don River and tagged abandoned bridges, Keating channel, Lower Don, revitalization of the don, The Don Narrows on April 8, 2015 by hikingthegta. It was by far the warmest hike of the year so far at 12 degrees feeling like 18. Before we got back to the cars we were carrying sweaters and coats. It was Good Friday and perfectly applicable that we should go to church. 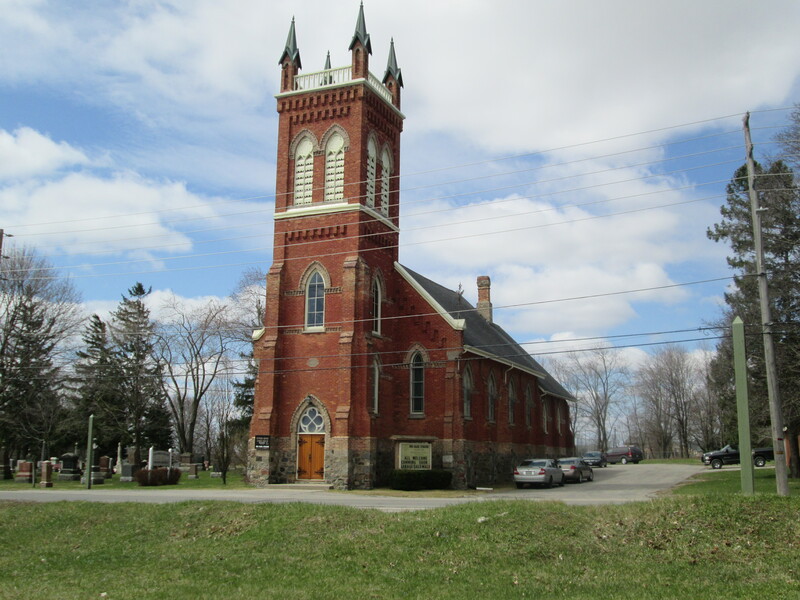 So we went to Churchville to explore the historical little village and the conservation area that separates it from Meadowvale. We parked in the same lot as last week where the Second Line dead ends below the New Derry Road. Crossing under the bridge we made our way north intending to make it as far as Steeles Avenue. 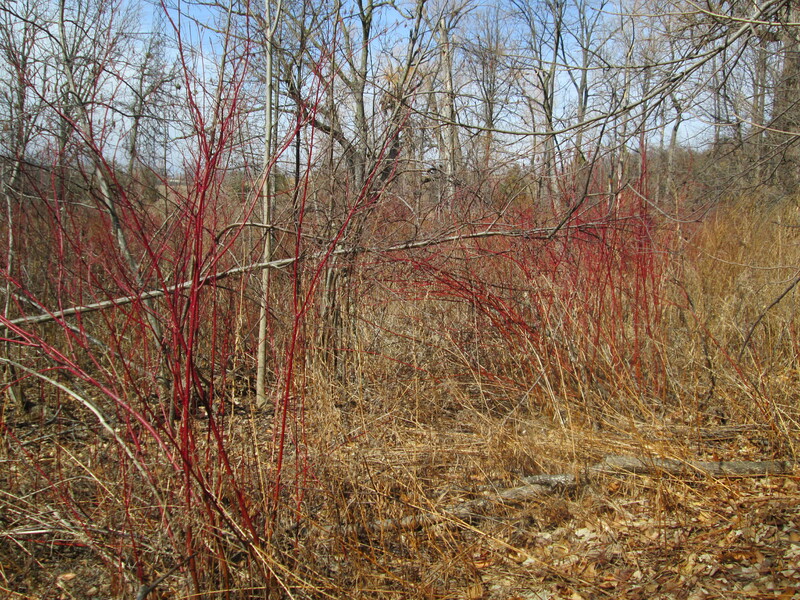 One of the first plants to respond to the warmer days and increased sunshine is the dogwood. Also known as Cornus Sericea they grow wild in wetlands throughout Canada. Their bark takes on a brighter red colour before the leaves come out. When the Derry Road Bypass (now just Derry Road) was built in the mid 1990’s the Second Line was closed where the bypass intersected it. 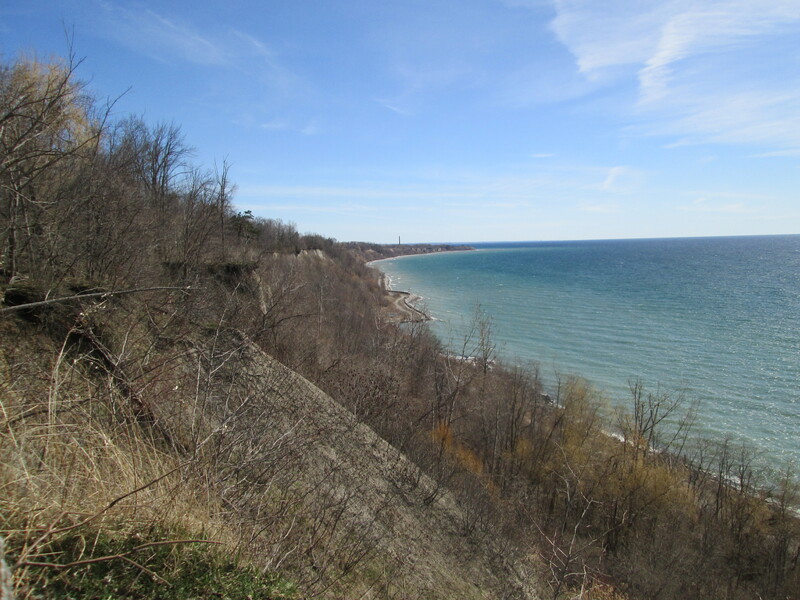 After investigating a woodlot just north of the bypass we headed west back toward the Credit River. 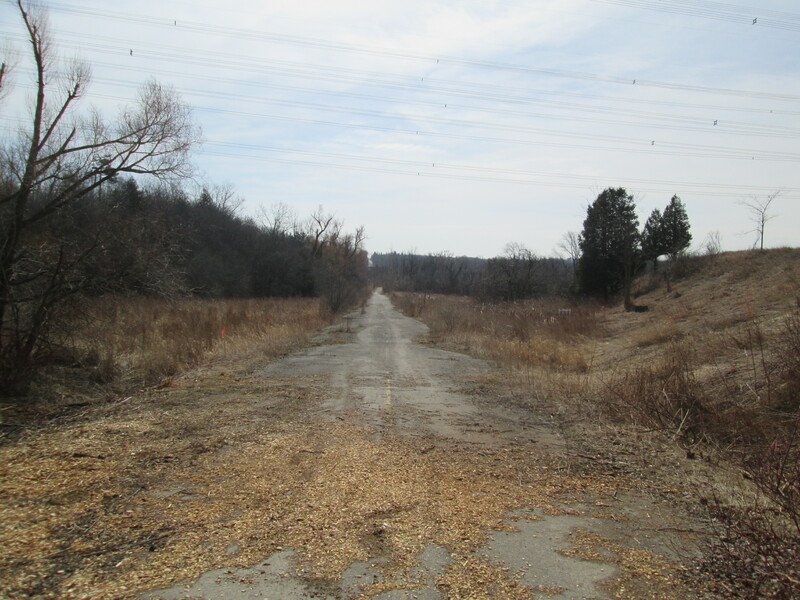 The picture below shows the closed second line looking south toward Meadowvale. The Credit Valley Railway (CVR) was incorporated in 1871 with a mandate to build a railway from Toronto to Orangeville with various branches westward to Waterloo. The railway stopped at Meadowvale where the station was at the corner of Old Creditview and Old Derry (now marked by a single old telegraph pole). It bypassed Churchville on the east and made it’s next stop in Brampton. By 1881 the CVR was in trouble and was incorporated into the Canadian Pacific Railway. 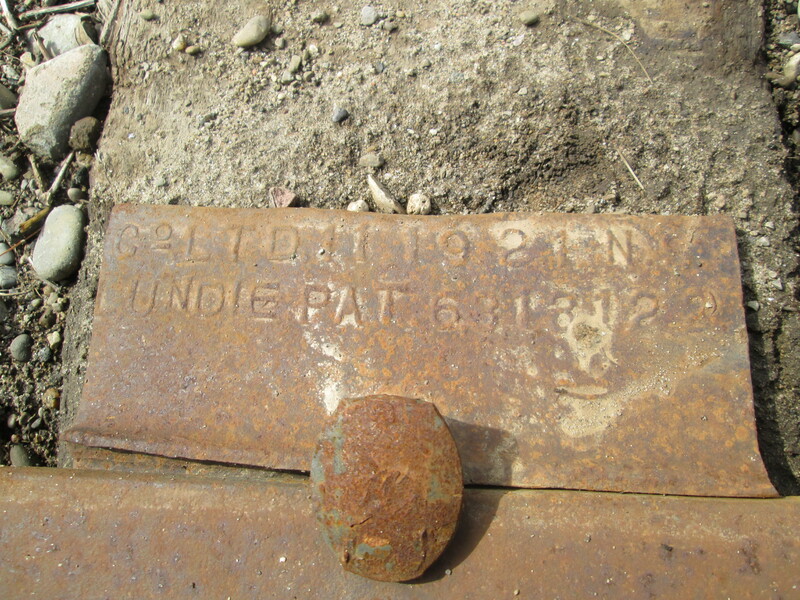 We crossed the old CVR tracks where some of the tie down plates are dated 1921 as seen below. 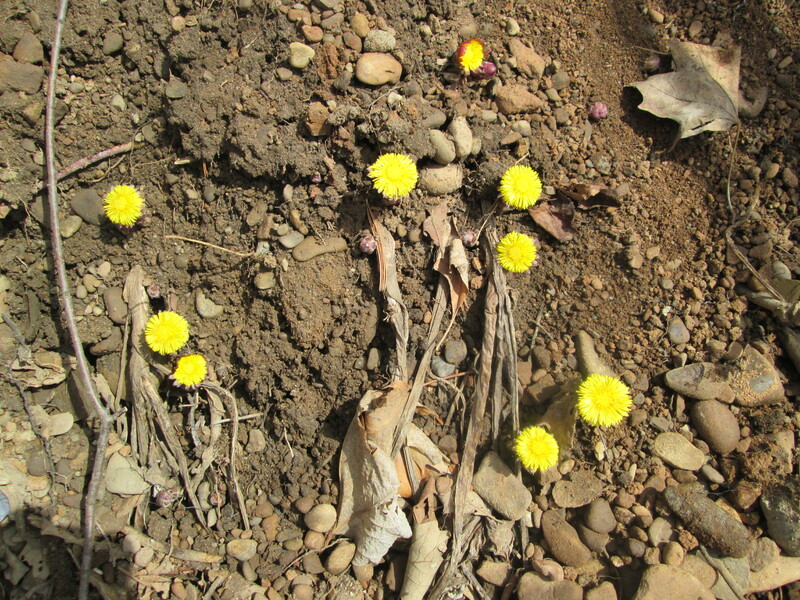 Perhaps the first new growth of the spring are these Coltsfoot flowers that are growing along the banks of the river. Coltsfoot are unique in that the flowers appear without the previous formation of any leaves. After the seeds are distributed the flower disappears and the leaves grow, making at appear to be a plant without flowers. The name comes from two Latin words which mean to act on, or cast out, a cough. We now know that the plant has certain toxic alkaloids that destroy the liver and some countries have banned it’s medicinal use. The plant which is the first sign of new life this spring turns out to be toxic to life, if ingested. In the picture below it looks like a dandelion but is too early and also lacks the green leaves. 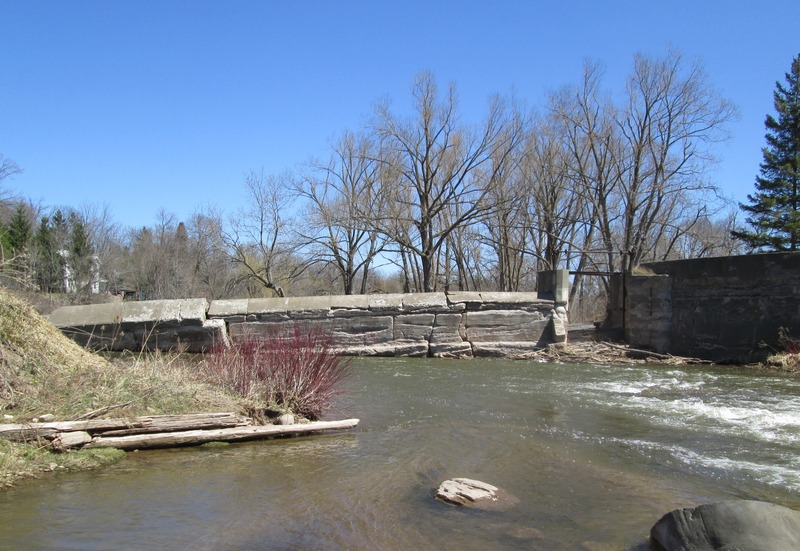 Built in 1907 the current one lane bridge over the Credit River in Churchville replaced several earlier wooden bridges that crossed the river in the centre of town. 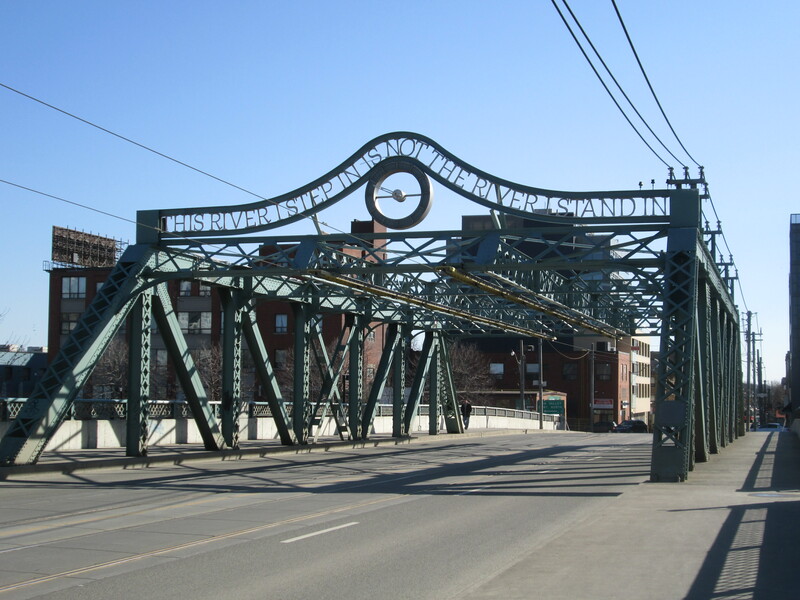 The bridge style is known as a steel pony truss bridge. A truss bridge is one of the earliest designs of bridges and was very common during the 19th and early 20th century. A truss bridge uses a design of triangles to keep the elements of the bridge stressed either through tension or compression. Where the sides extend above the roadway but are not connected across the top it is known as a “pony truss”. 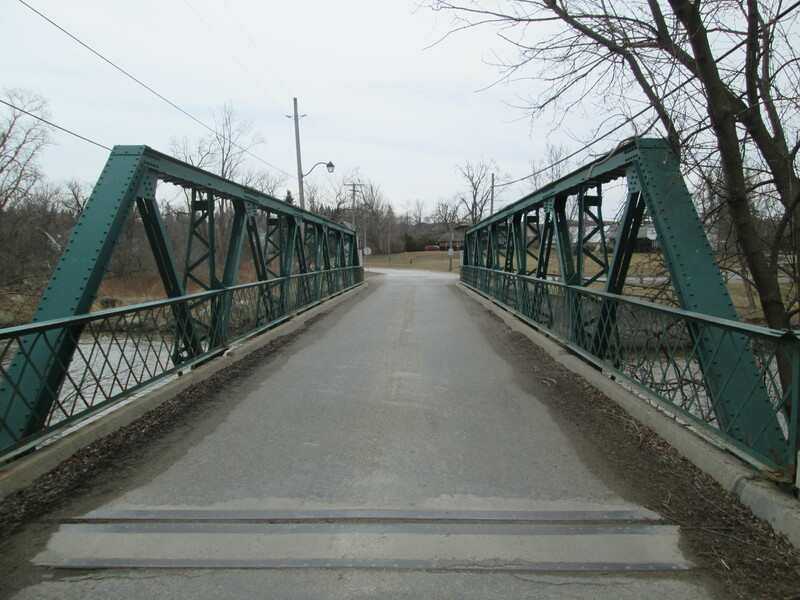 This bridge is one of only two single lane bridges remaining in Brampton. A 1911 picture of the bridge is featured in the cover photo. It was taken at about this time of year and large slabs of ice are melting beside the bridge abutments. Of note are the three people who are standing on the outside of the bridge railing in the historical photograph. Amaziah Church founded the town in 1815 when he built mills on the Credit which were at first known as Church’s Mills. 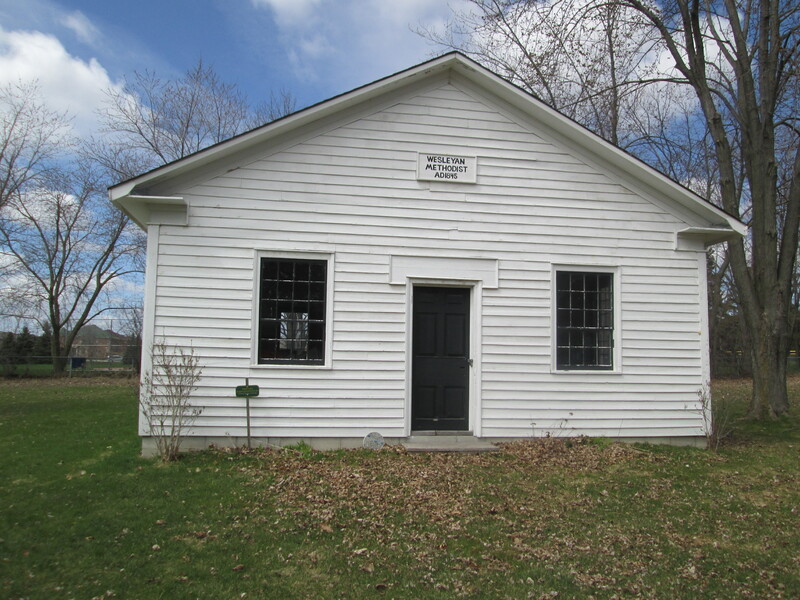 With a population of 80 it got it’s own post office and the new name of Churchville in 1831. By the 1850’s it had peaked at over 200 people and was home to 5 mills and over 20 small businesses plus three general stores. The crash in grain prices following the Crimean War hurt the small milling community and between 1866 and 1877 all of the mills closed. In 1875 a fire destroyed much of the town, which was never rebuilt. The failure of the CVR to come into town in 1877 was a final blow to ensure it wouldn’t recover from it’s decline. Of the 98 homes that once stood in the village less than 20 remain. 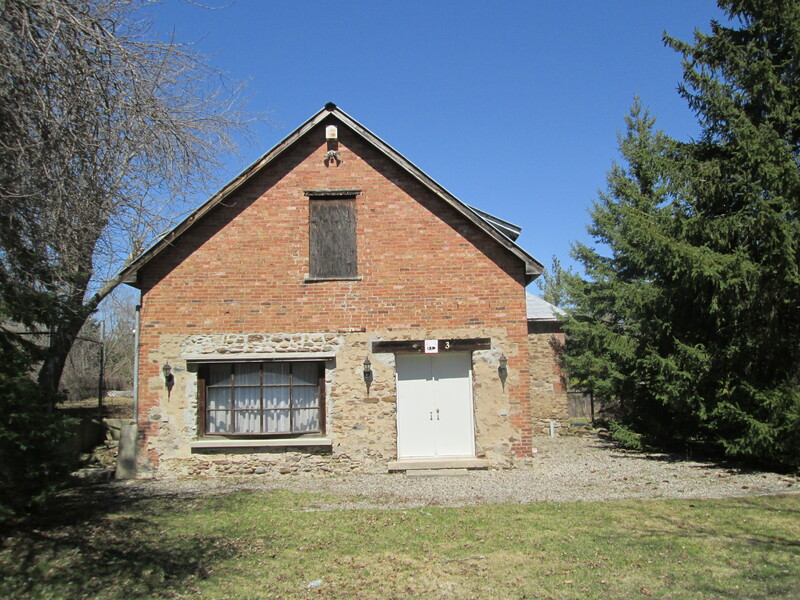 This building dates to 1840 and may have originally been a wagon shop belonging to Thomas Fogerty. It served as the final general store for the community and lasted until the 1960’s when it was converted into a residence. The original store windows have been hidden when the front porch was enclosed. Formerly known as the May Hotel this 1830’s structure is one of the oldest surviving buildings in Churchville. At one time there were three churches in town. The Anglican and Episcopalian churches have been lost and the only one remaining is the Weslyan Methodist, built in 1856. 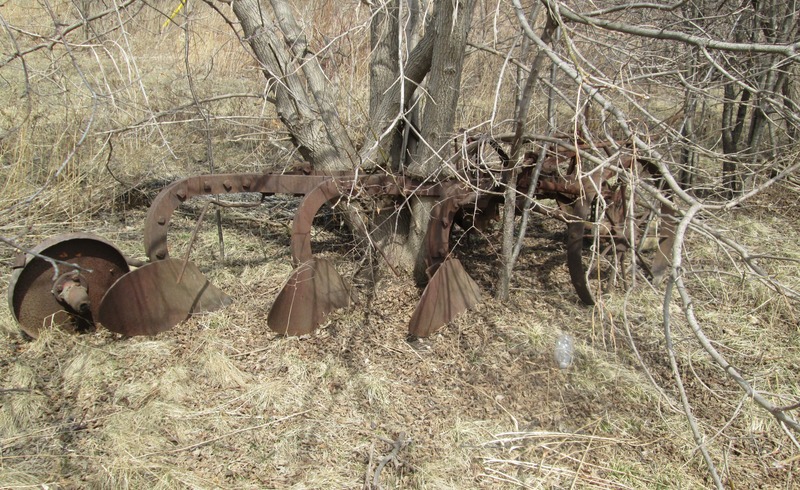 The old plow in the picture below has been sitting in one place for so long that a group of small trees is growing up in the middle of the frame. The first burial in the Churchville cemetery was Amaziah Church in 1831. 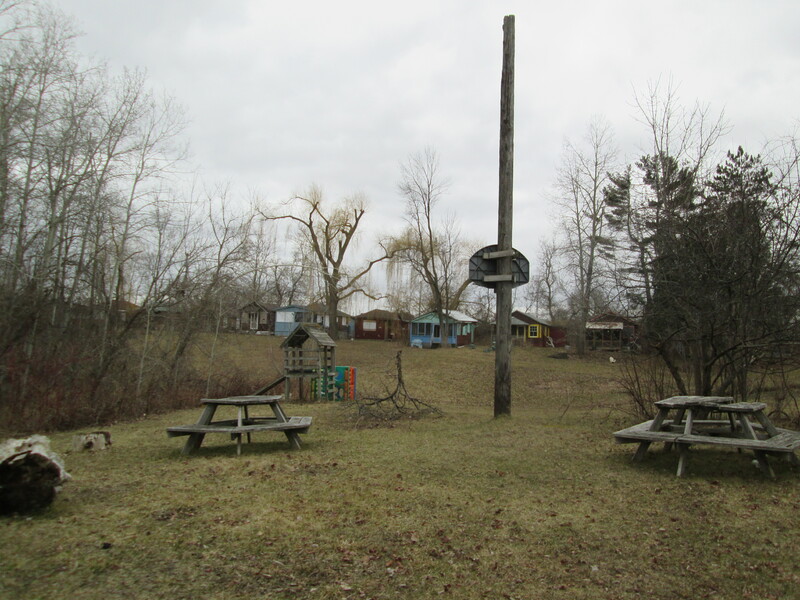 The town of Churchville sits on the floodplain for the Credit River and has experienced repeated flooding over the years. 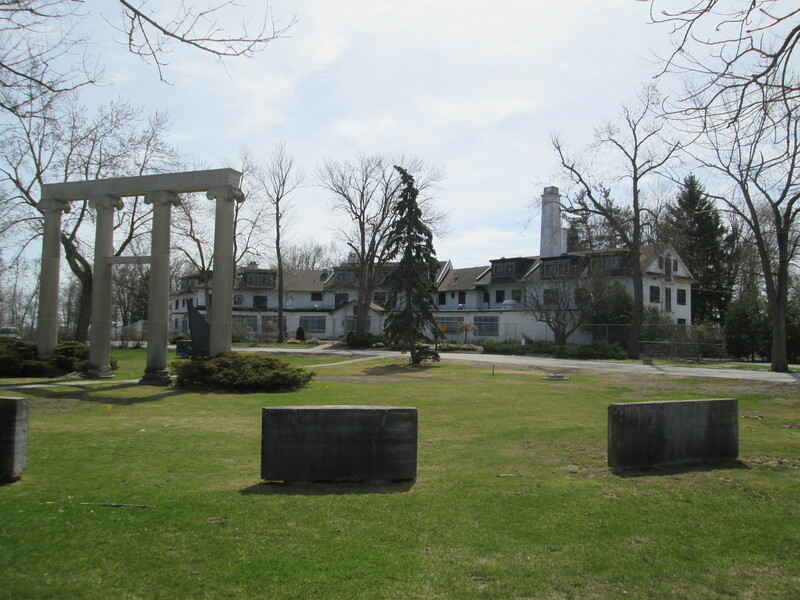 When the town was recognized as a Cultural Heritage District it was decided to do something to protect the historic homes in town. In 1989 a protective berm was built between the river and the homes along it’s east side. 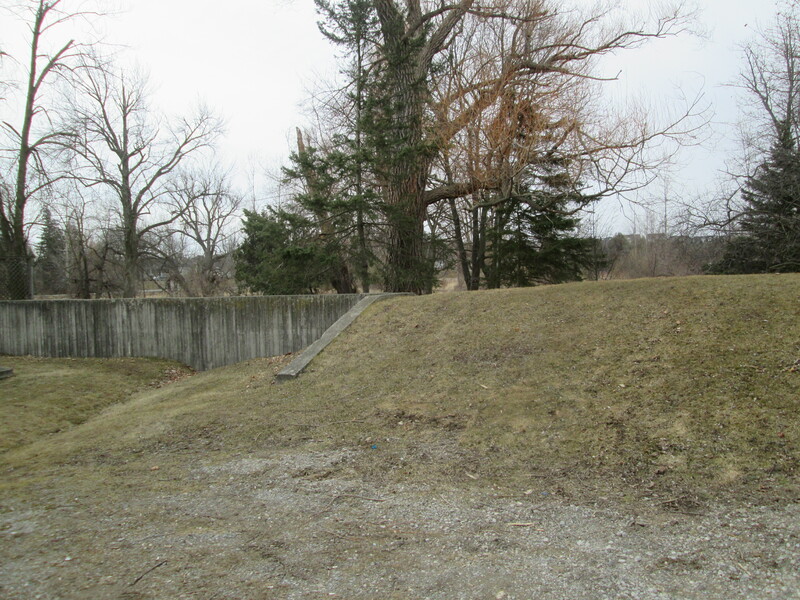 Behind houses it has been built with a concrete wall and between houses the gentle slope of the berm can be seen. 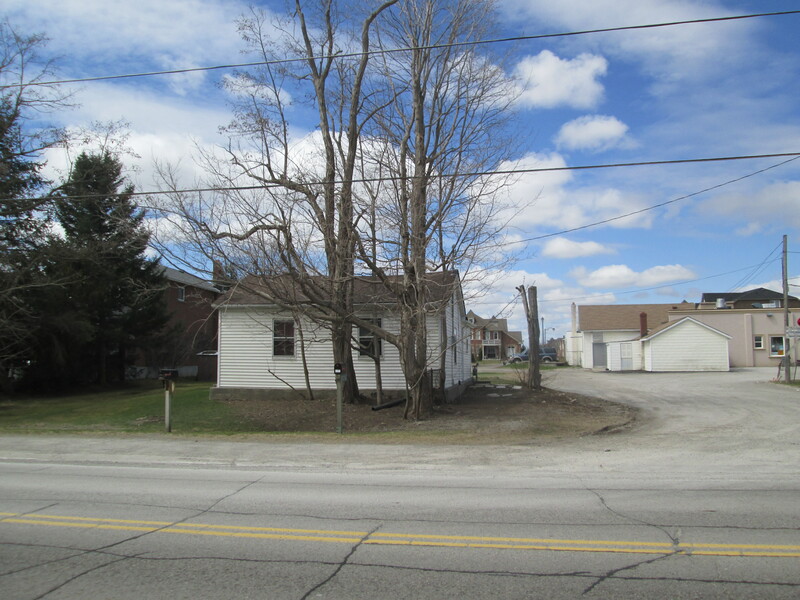 The picture below is taken from beside the former volunteer fire department station. Tagged on the plate as a 100 year vehicle it was appropriate that we saw it entering the 1907 bridge. 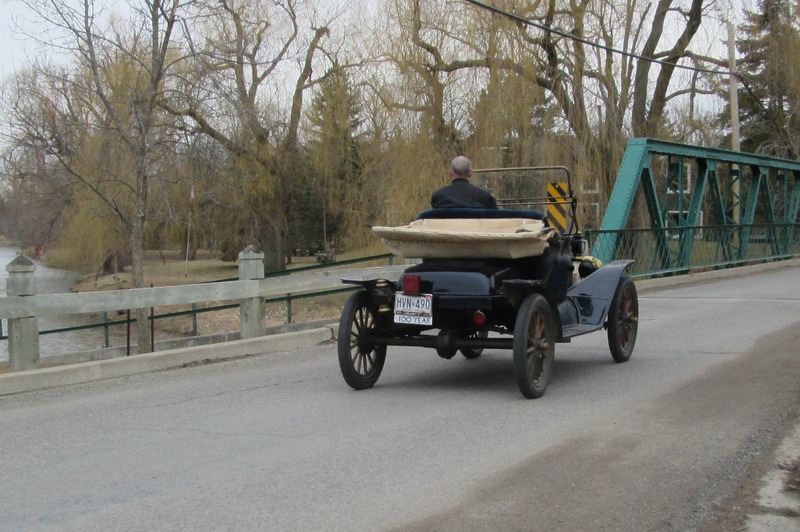 This entry was posted in Credit River and tagged 1900's Ford Car, Churchville, Coltsfoot, Credit River, Dogwood, Pony truss bridge on April 5, 2015 by hikingthegta.